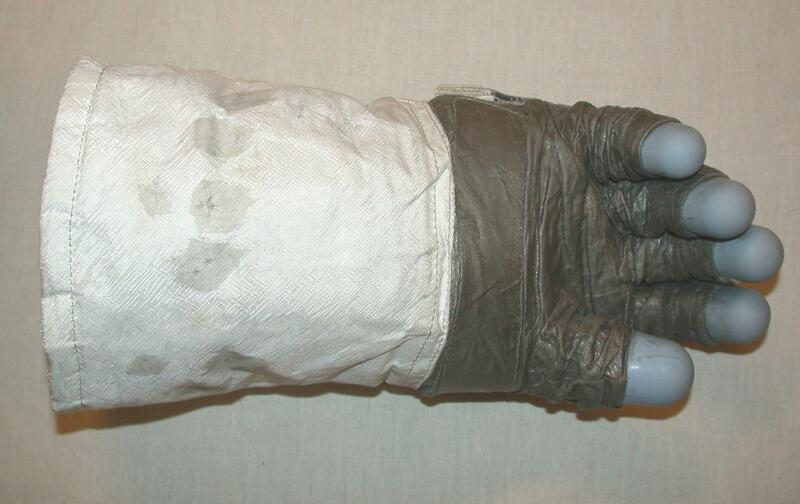 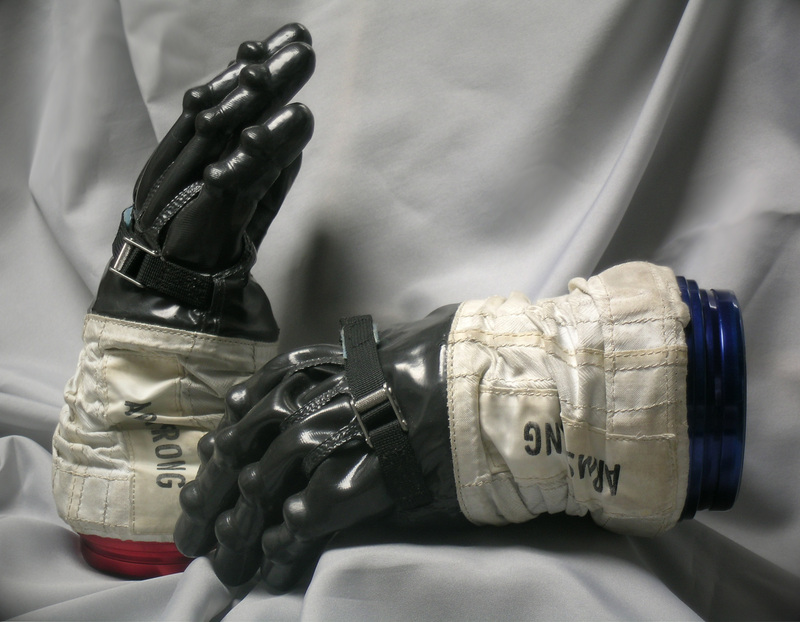 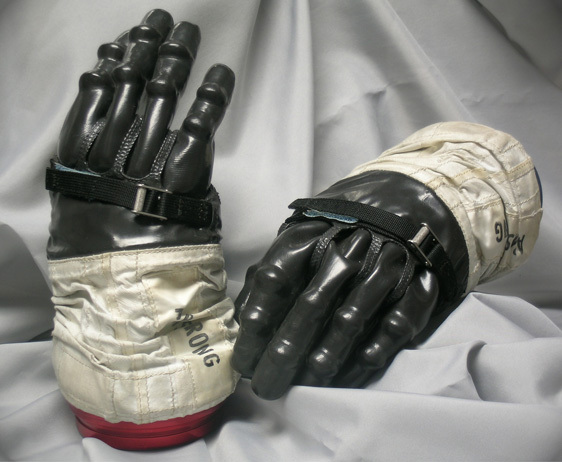 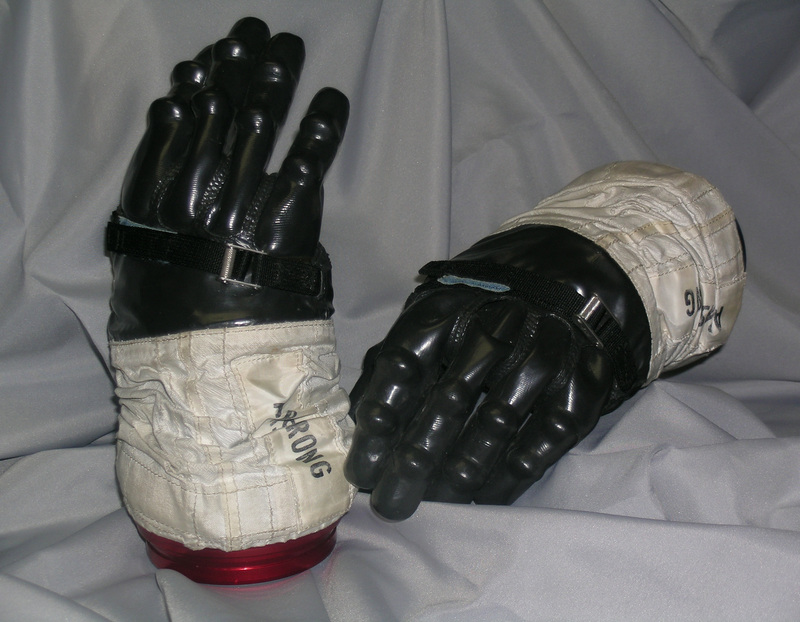 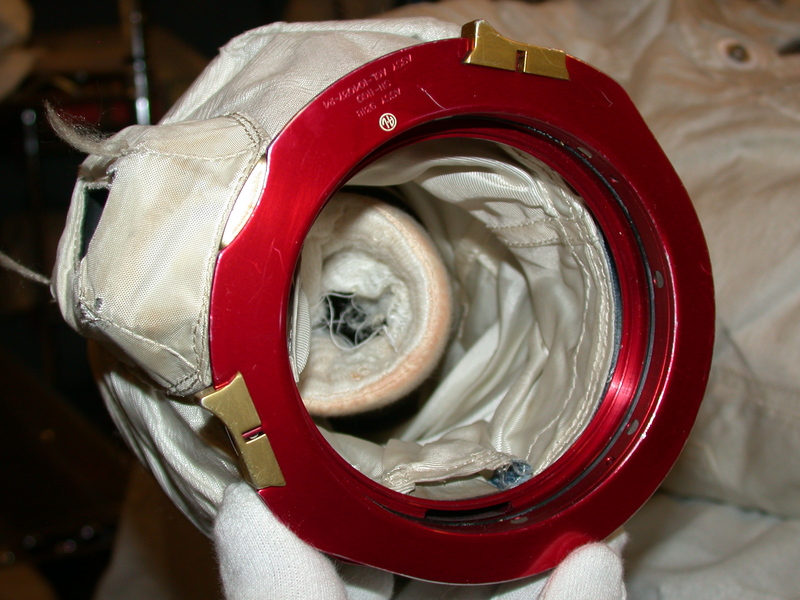 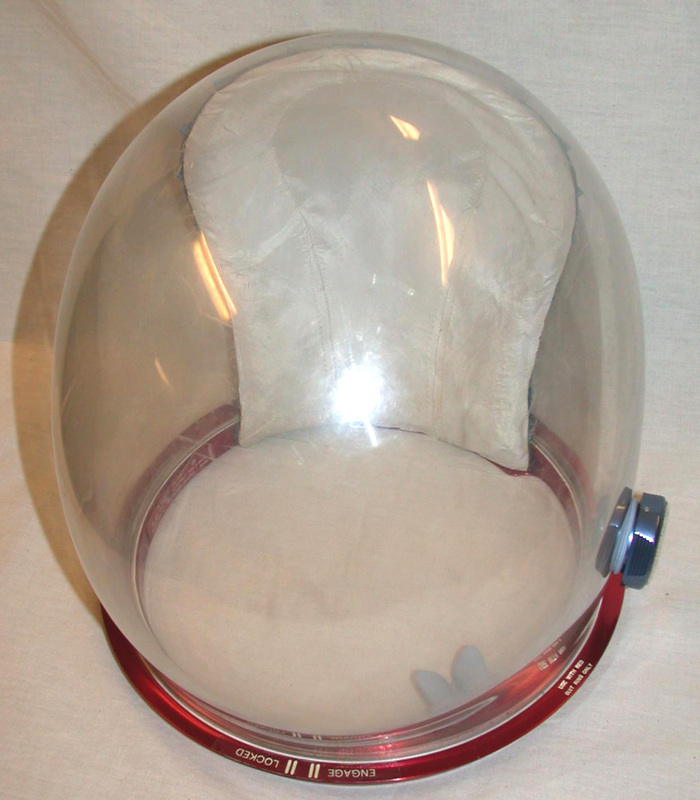 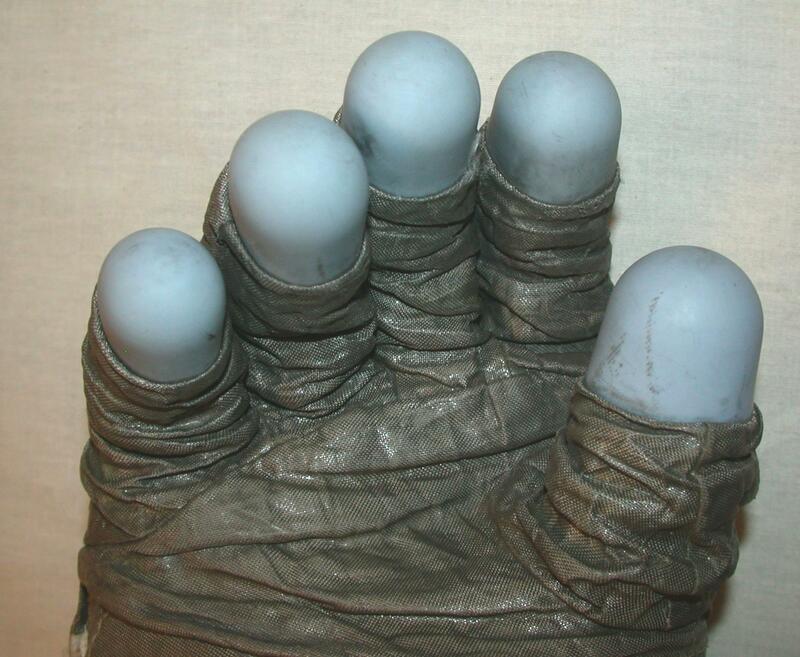 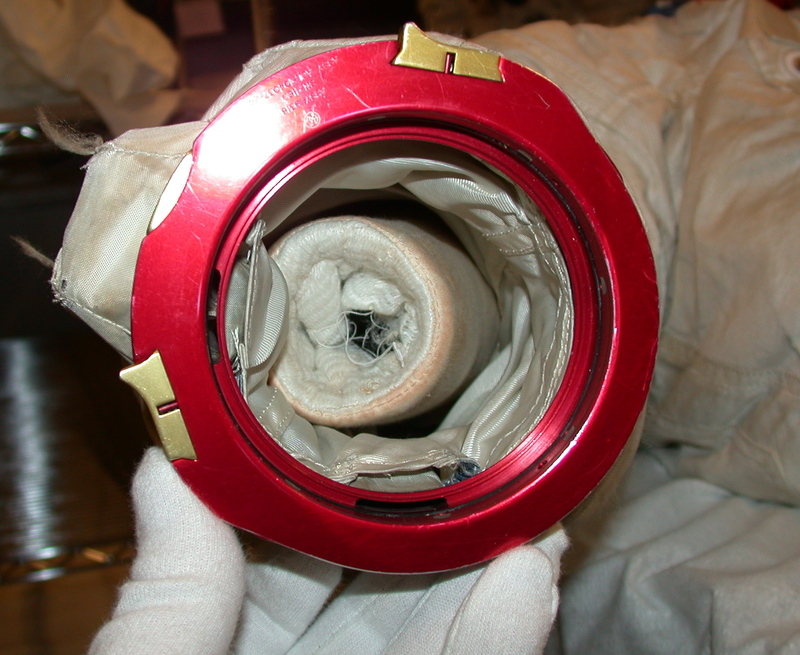 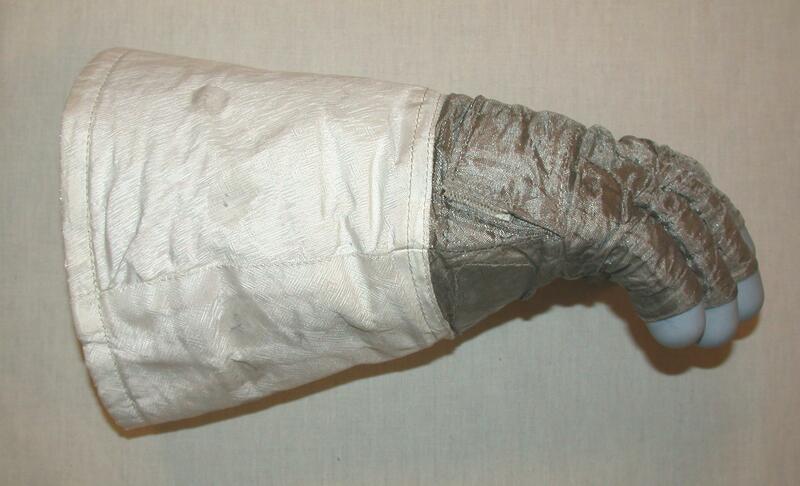 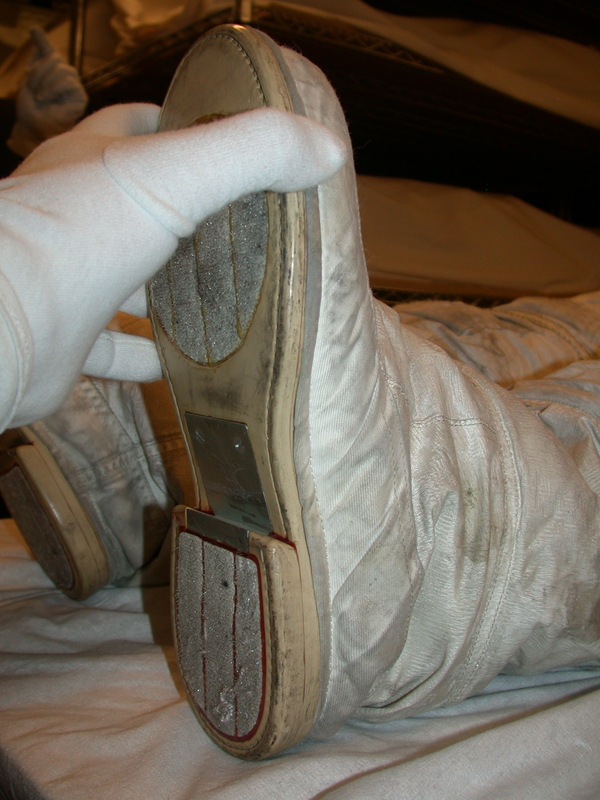 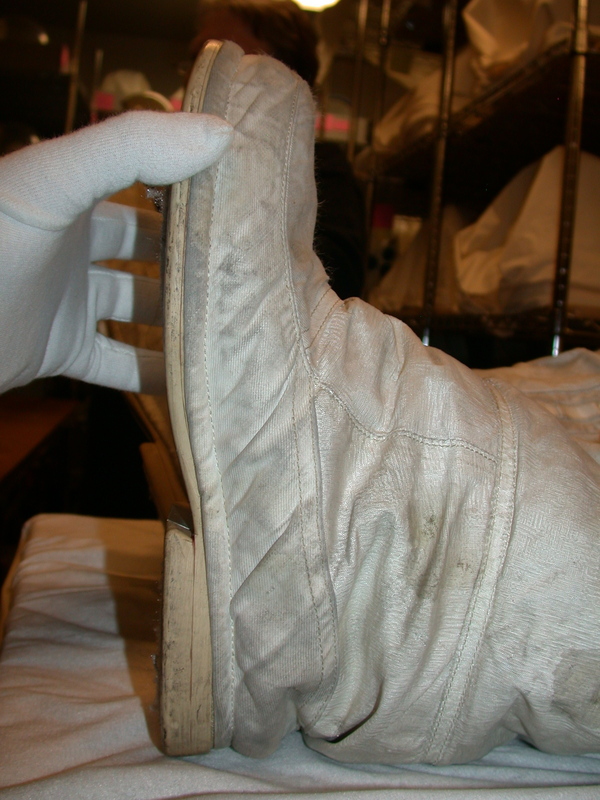 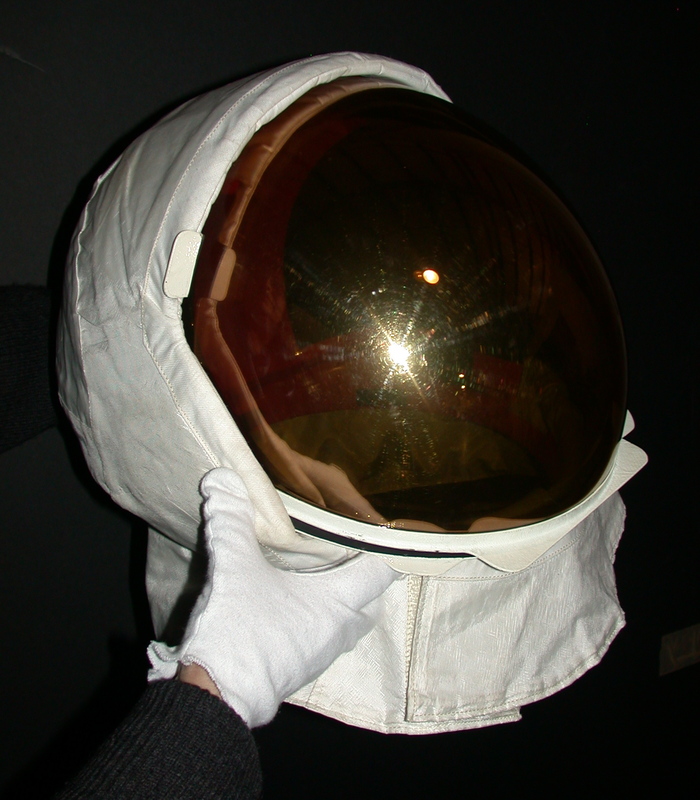 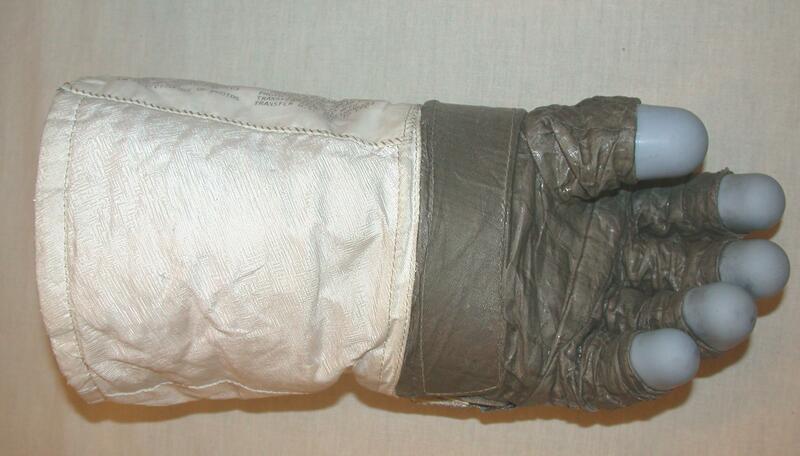 Neil's IV gloves as displayed at the Kansas Cosmosphere. 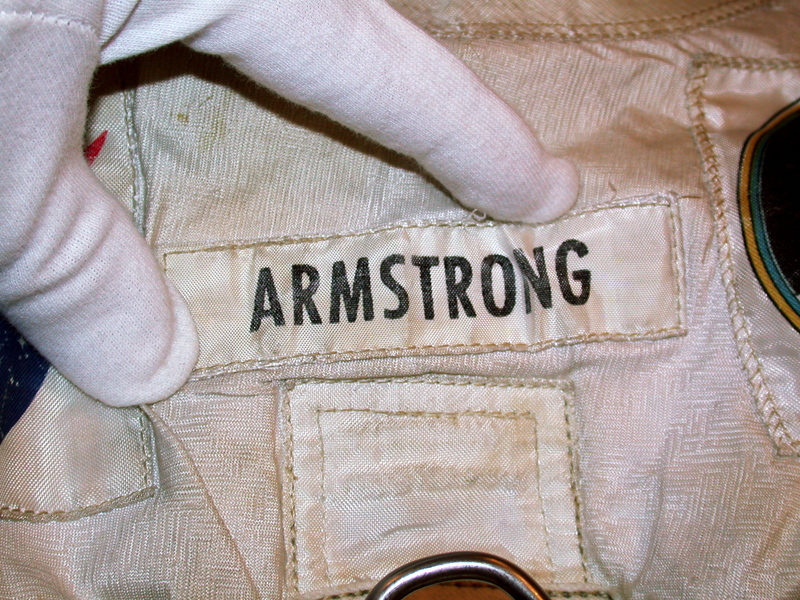 Photos in this section courtesy Jim Remar of the Cosmosphere. 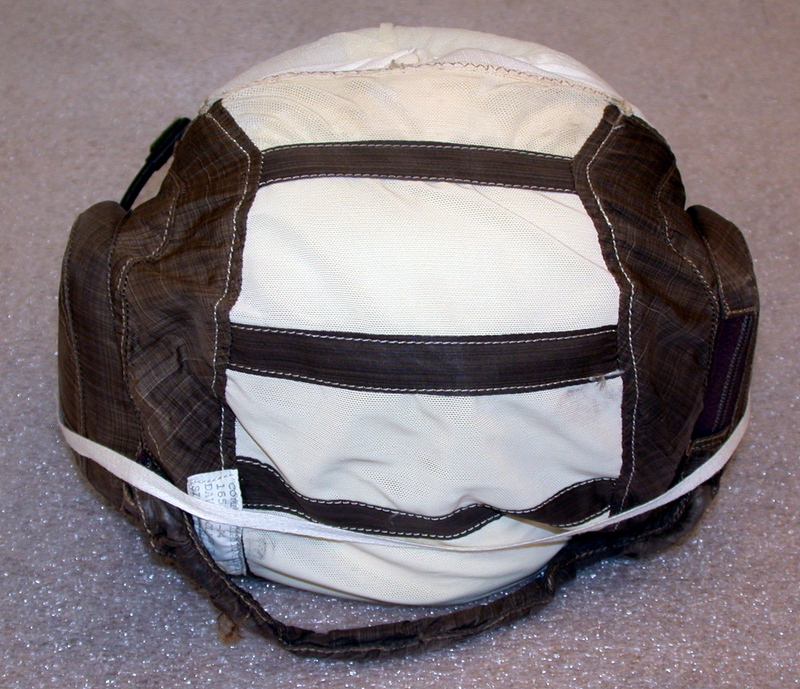 (Click on the image for a larger version. 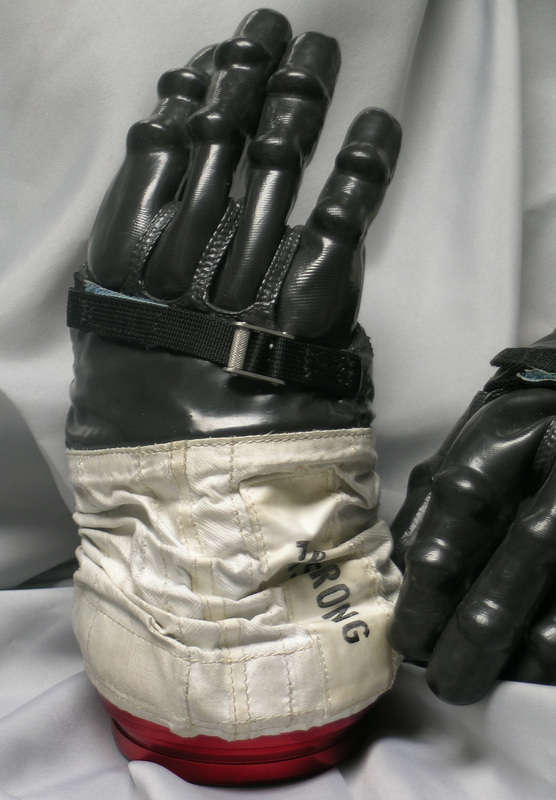 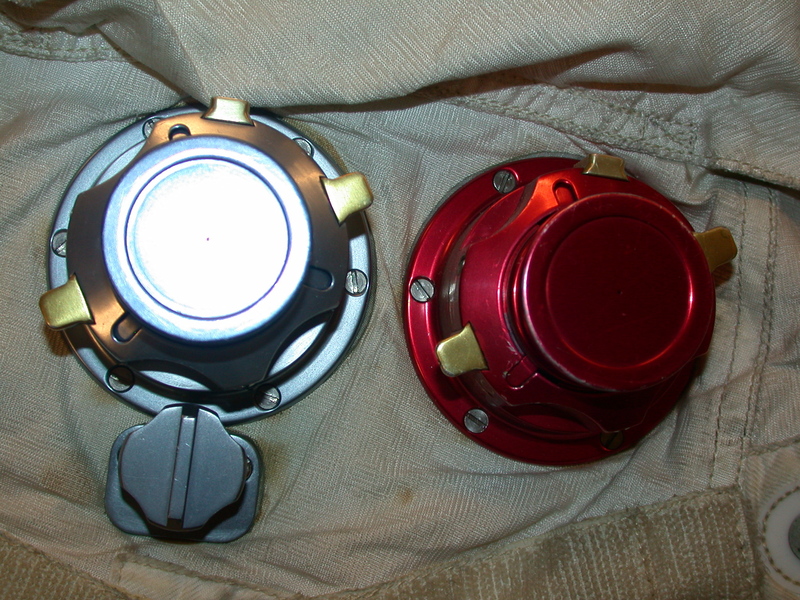 IV Gloves - Second View ( 1210k ) These gloves were worn only for pressurized operations in the spacecraft and were not worn during the EVA. 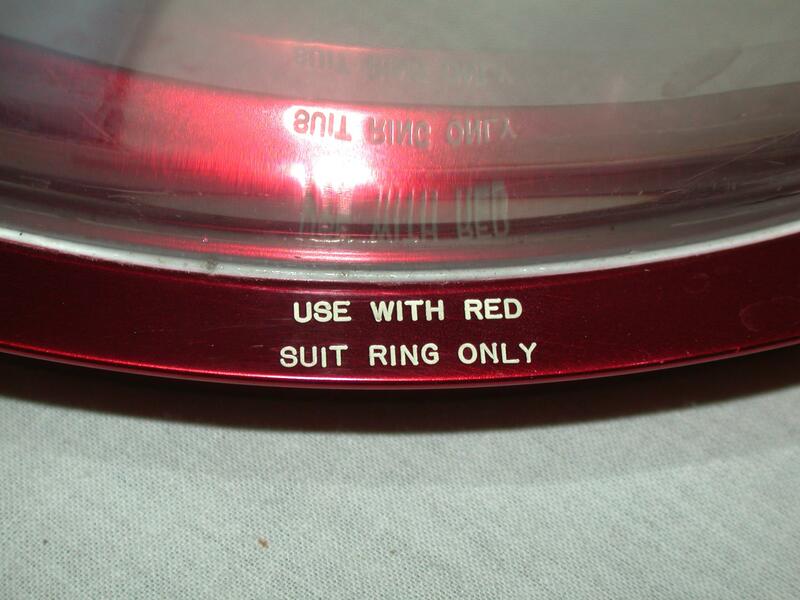 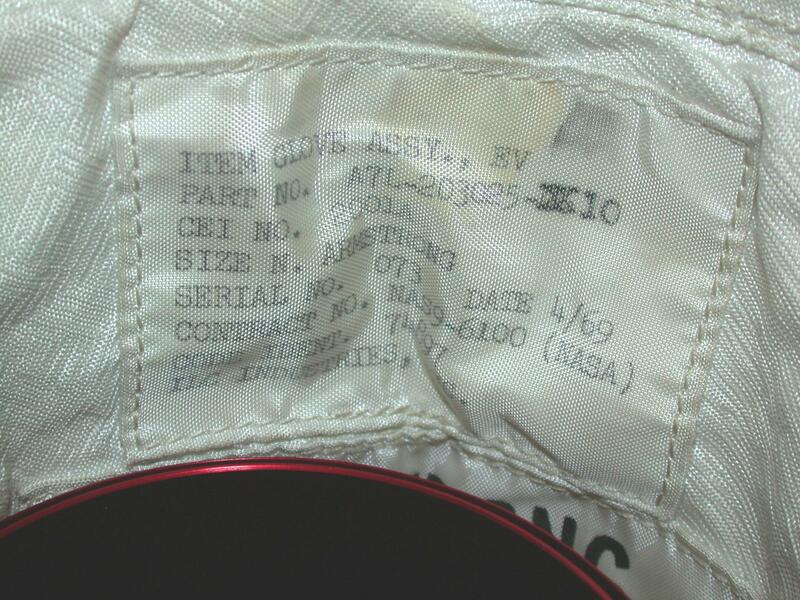 Buzz's tasks are enclosed in parentheses. 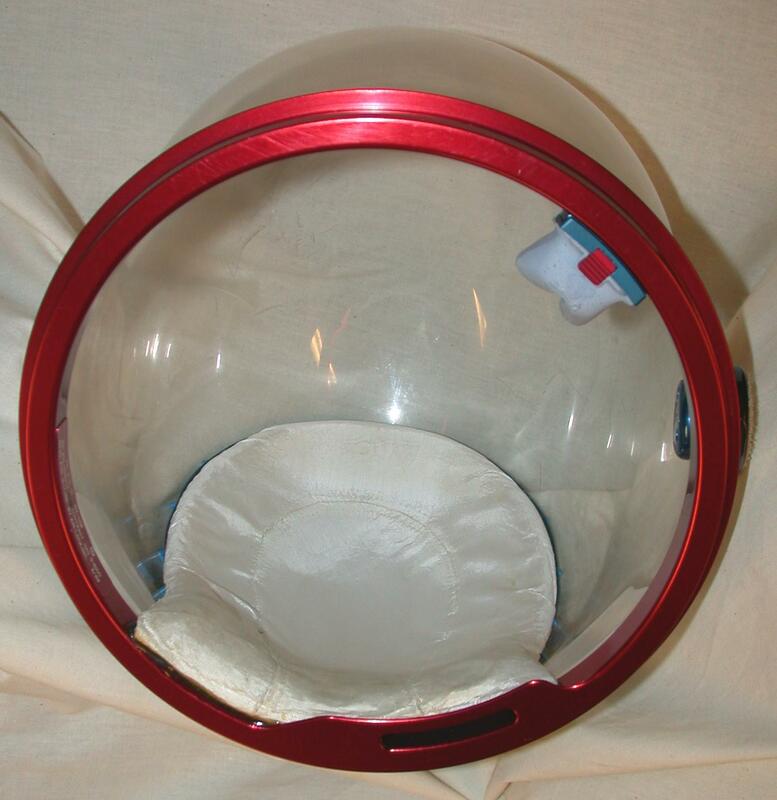 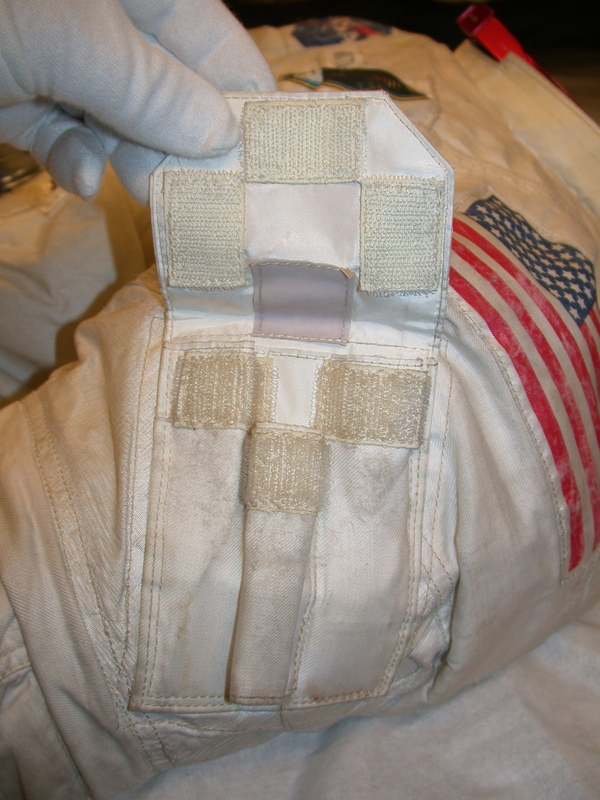 Note that neither the flag deployment nor the contingency sample are on Neil's checklist. 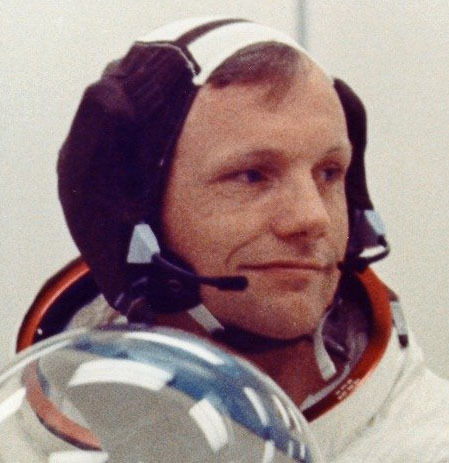 Neil after donning his Comm Carrier during pre-flight suit-up, 16 July 1969. 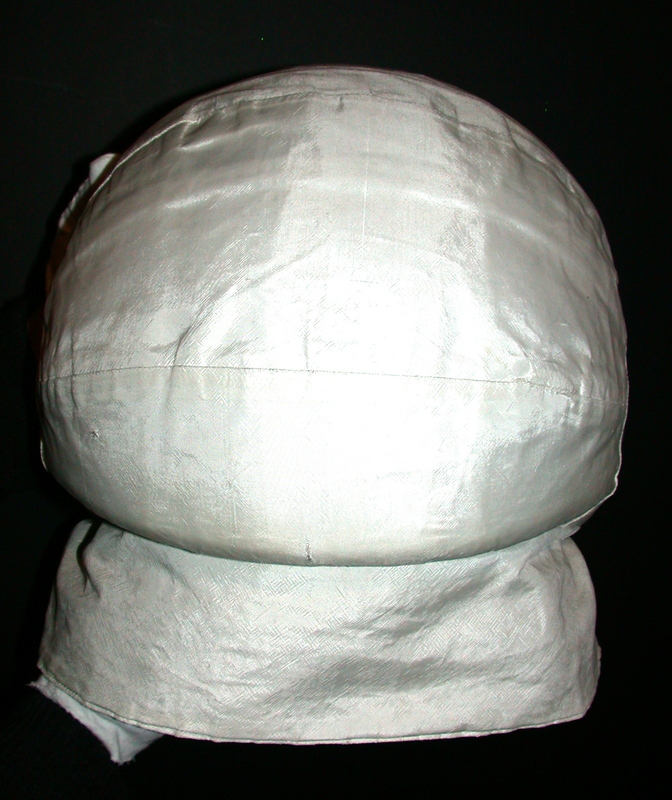 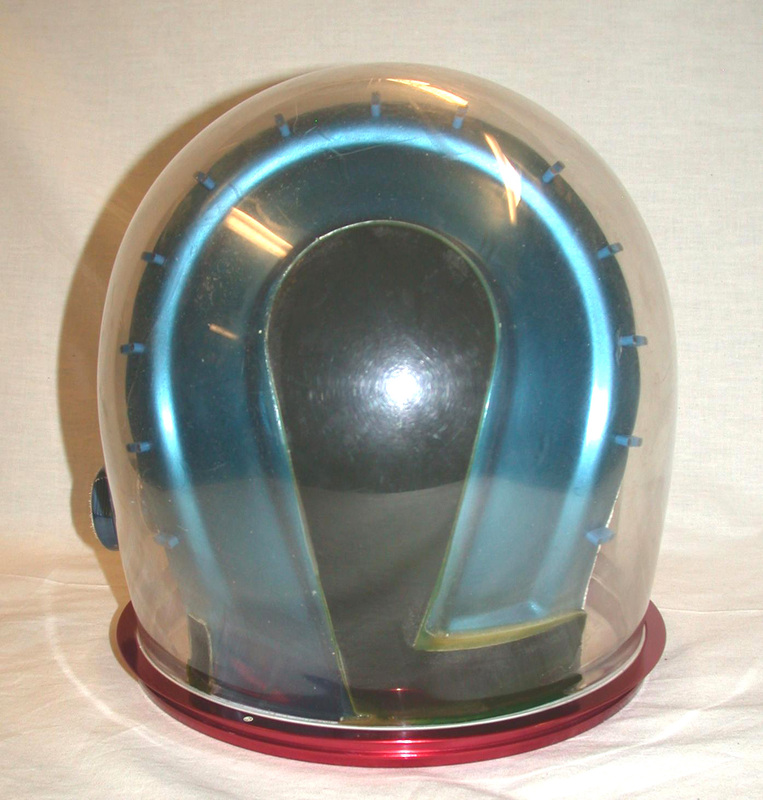 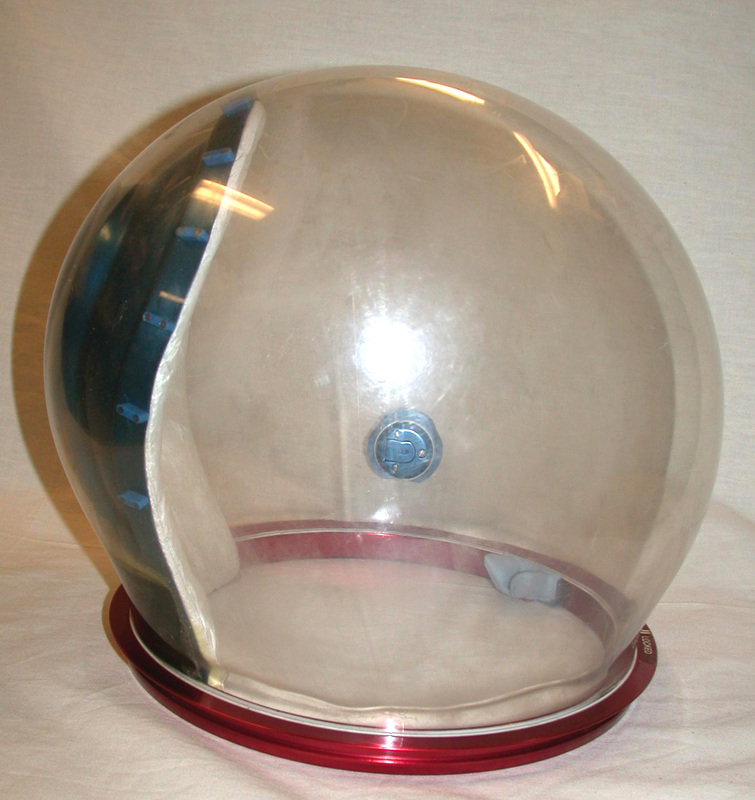 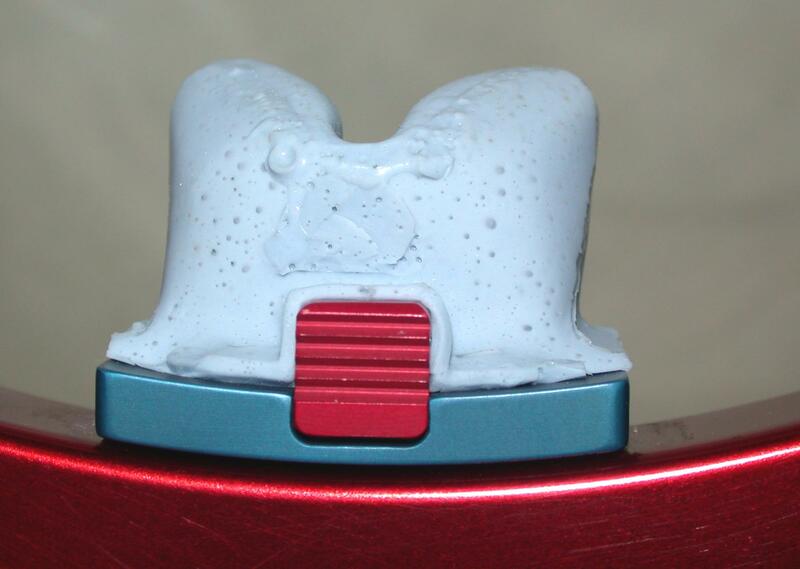 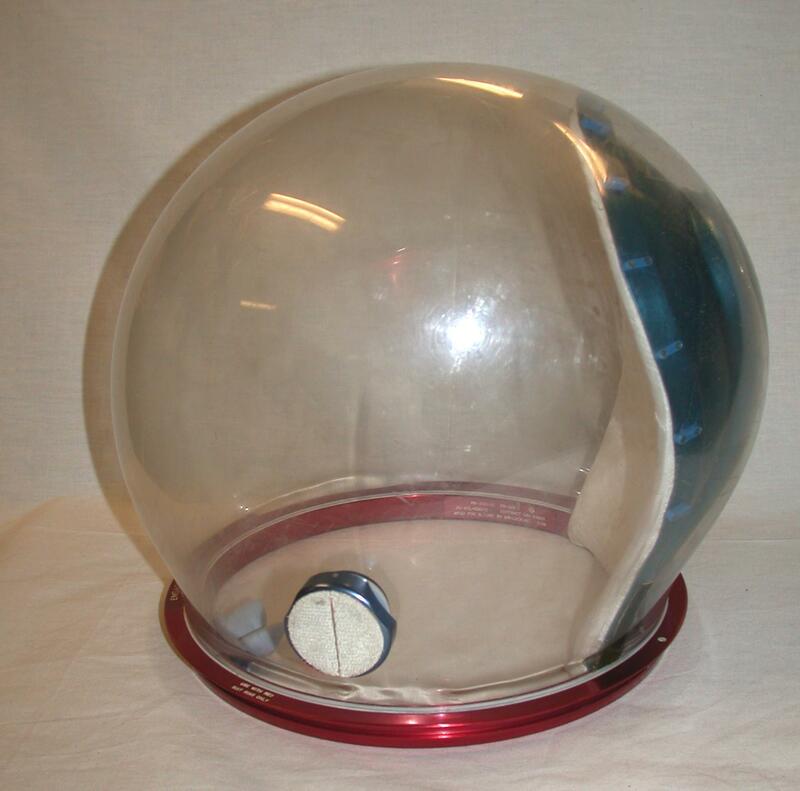 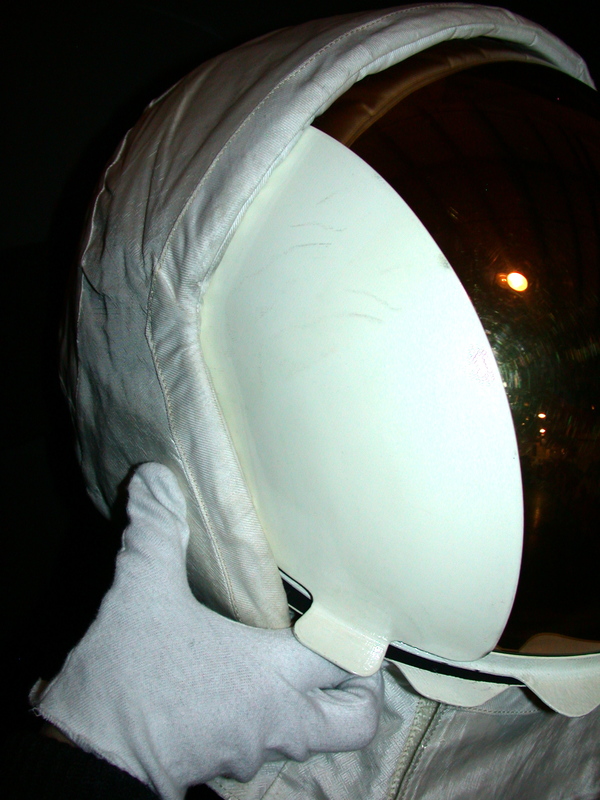 He is holding his Intravehicular (Bubble) Helmet. 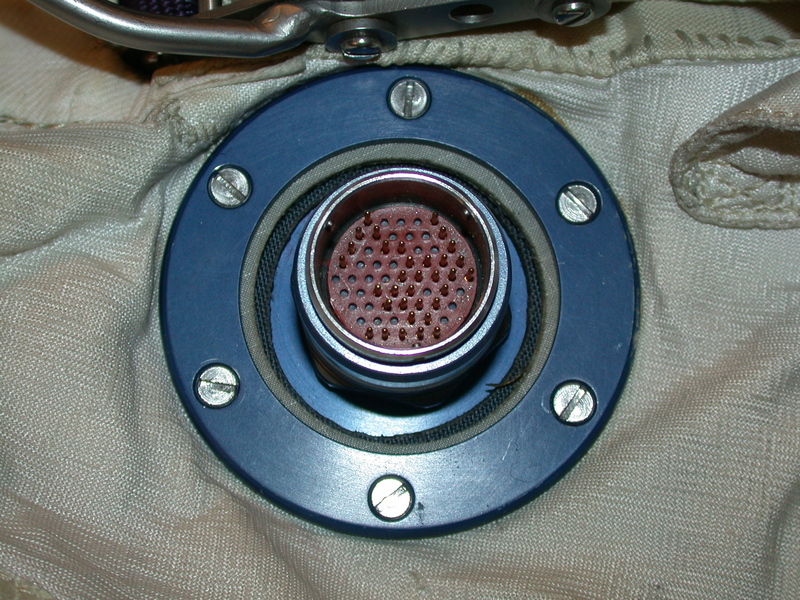 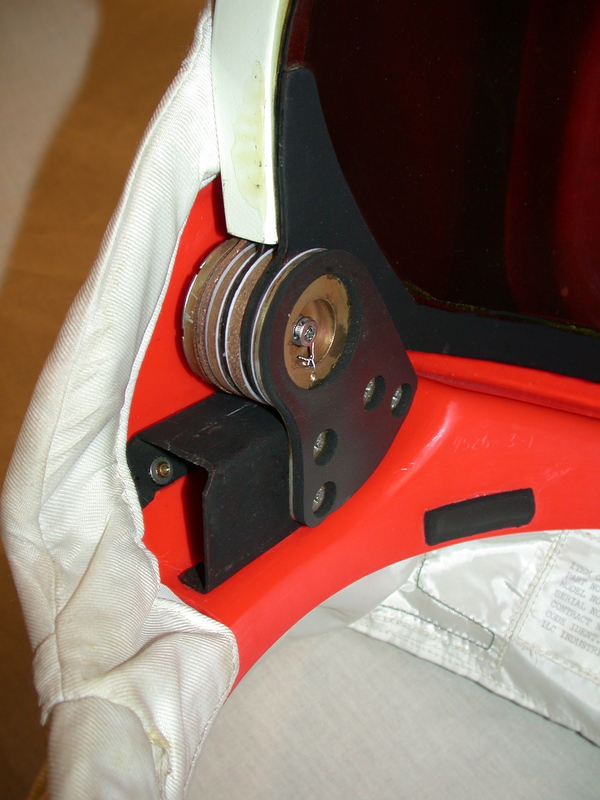 Detail from NASA photo KSC-69PC-377. 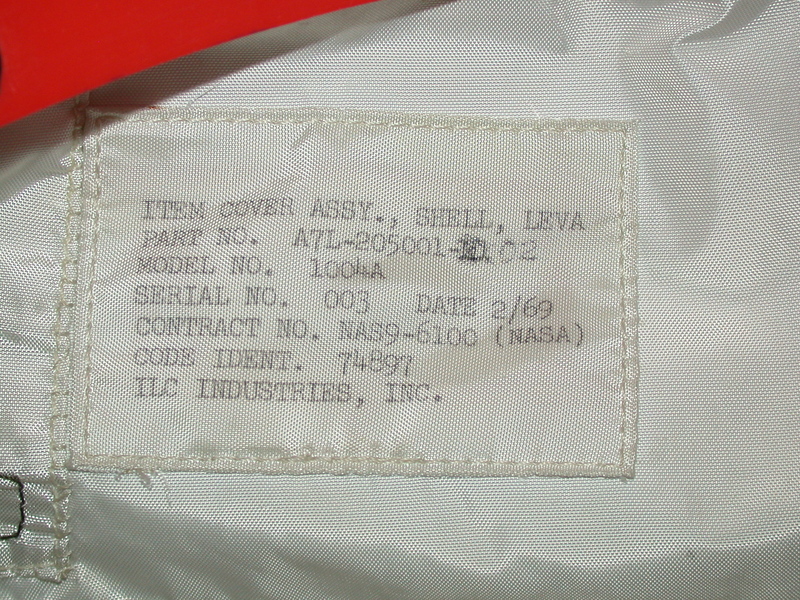 albeit, usually hidden from view by the LEVA. 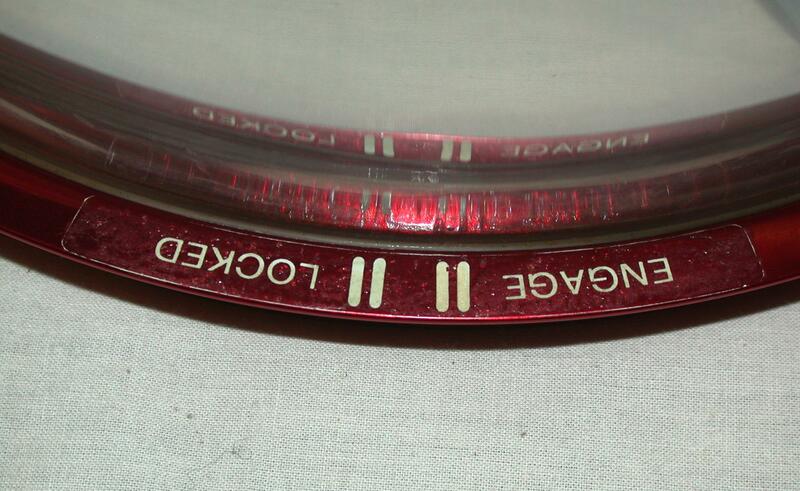 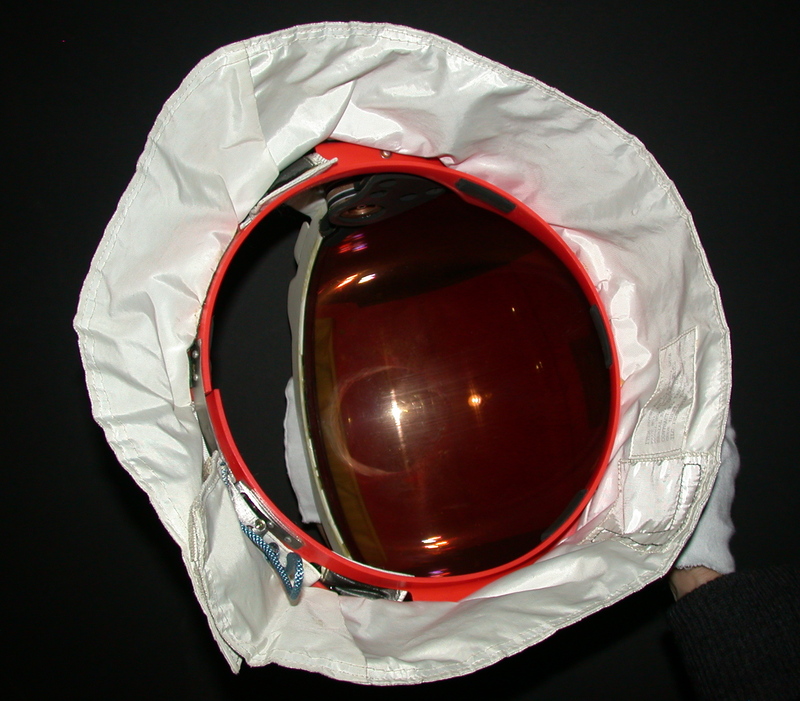 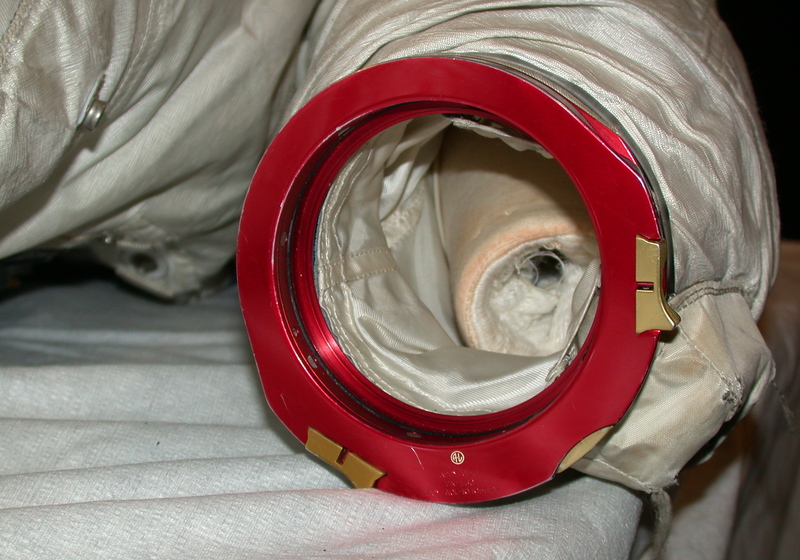 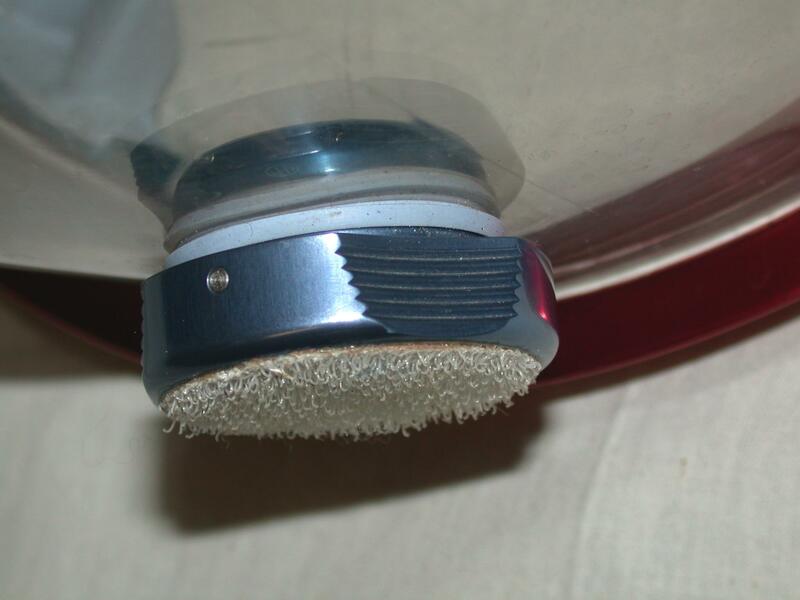 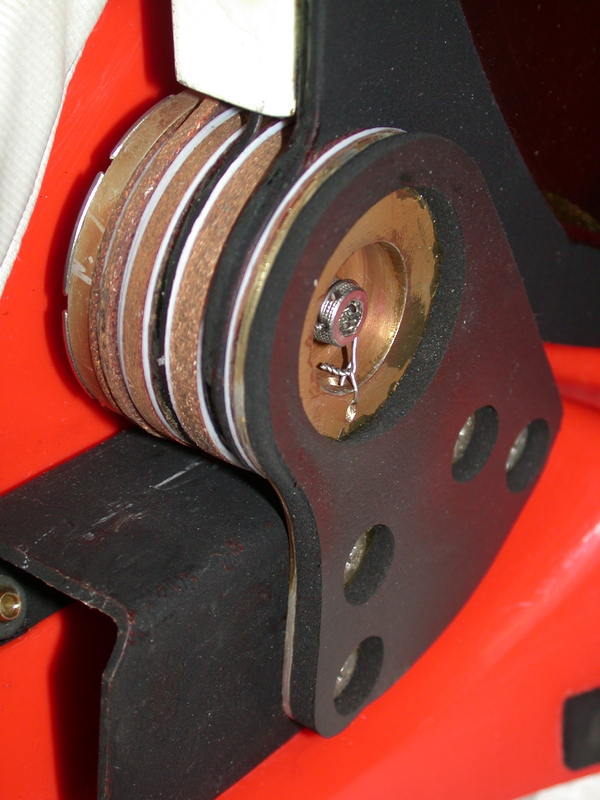 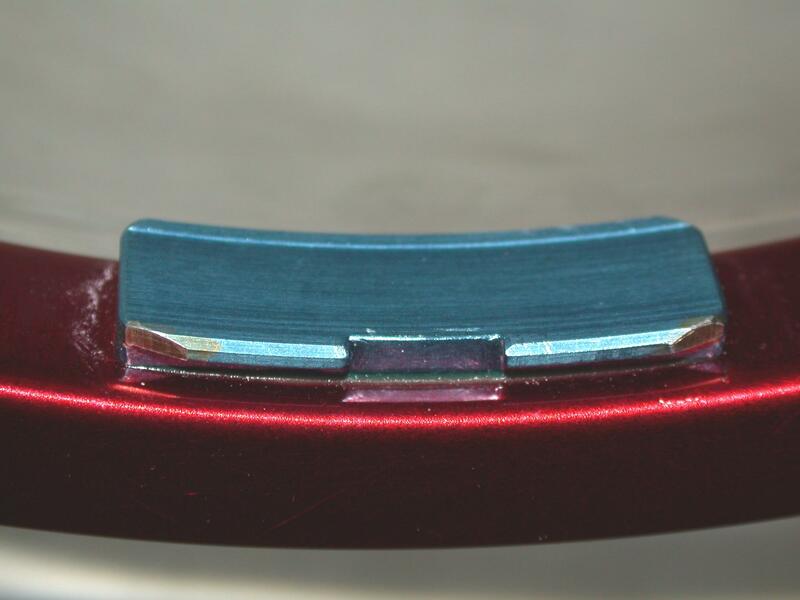 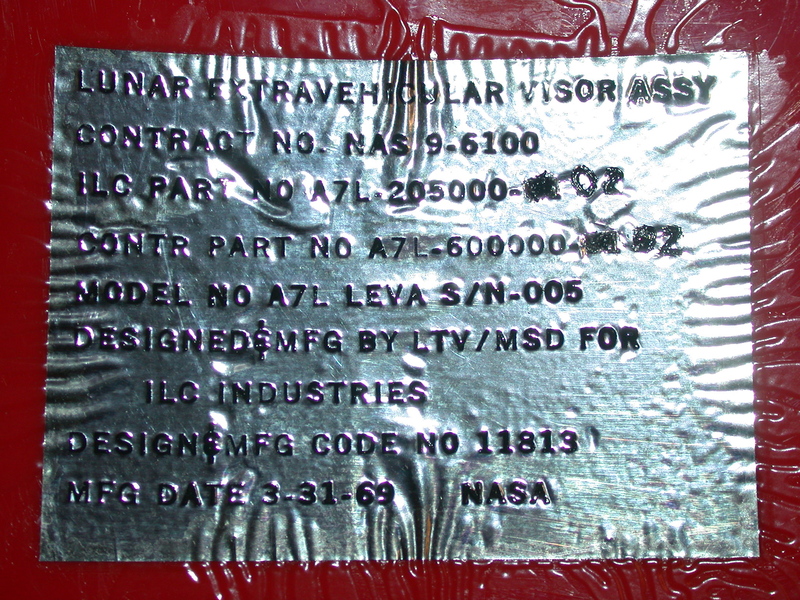 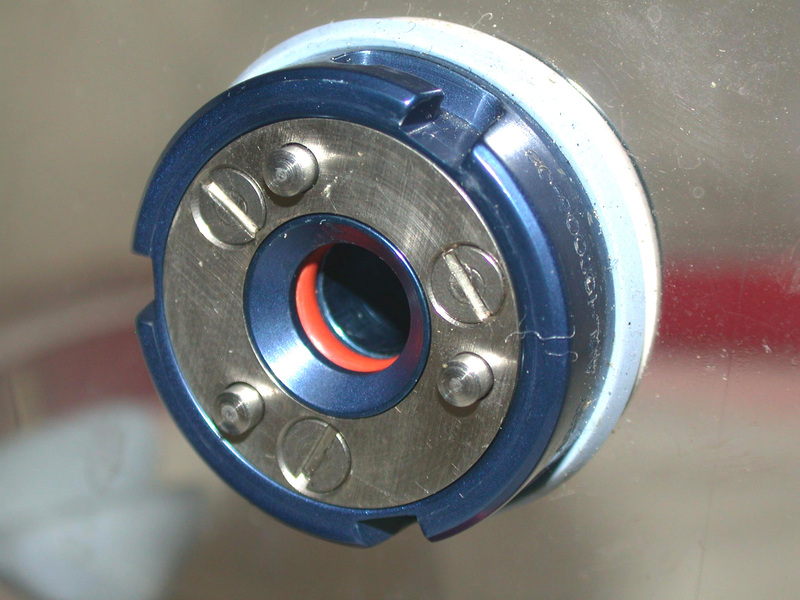 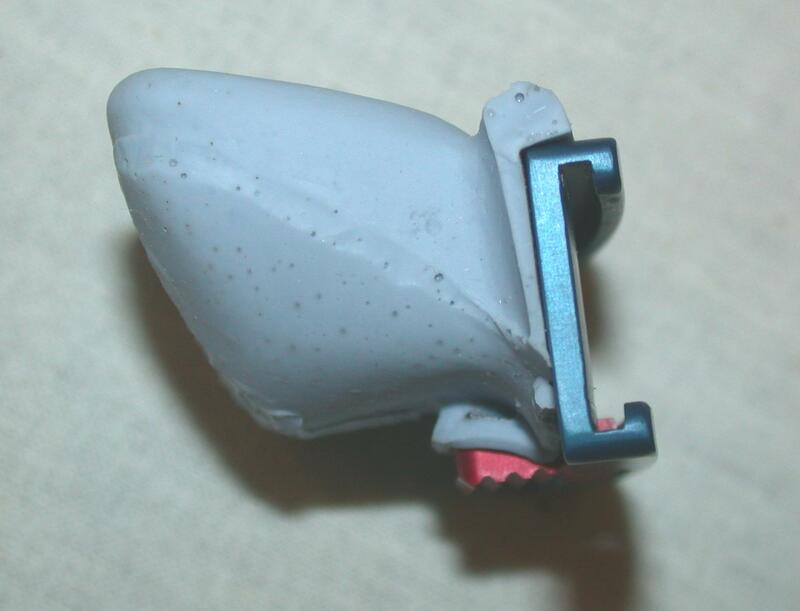 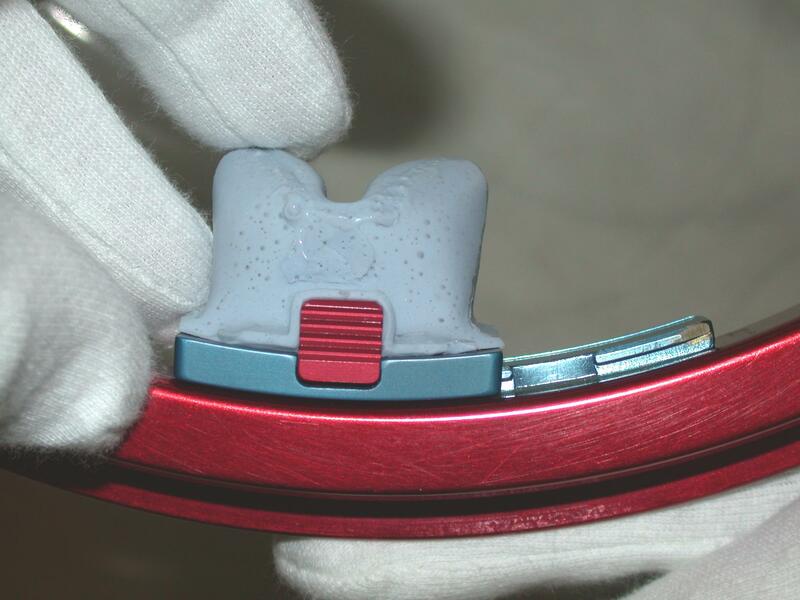 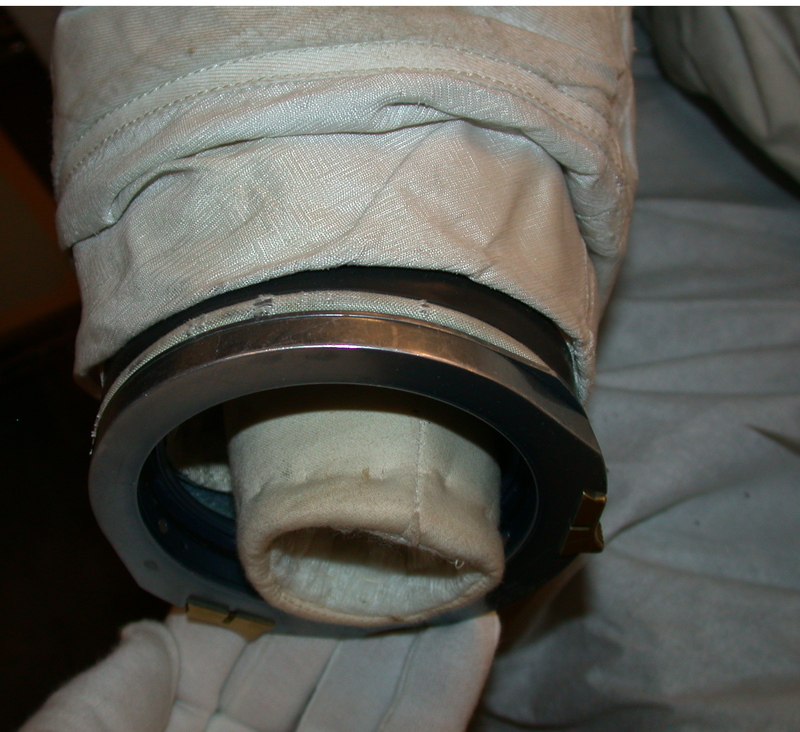 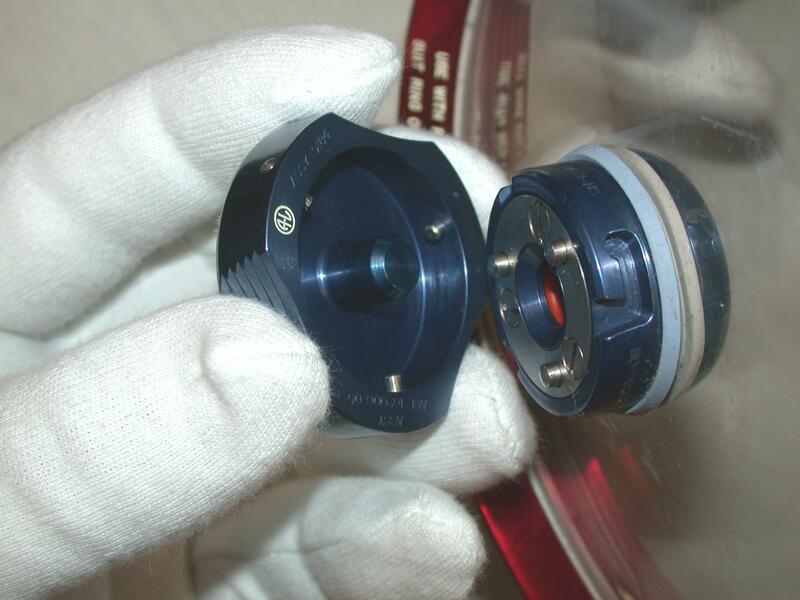 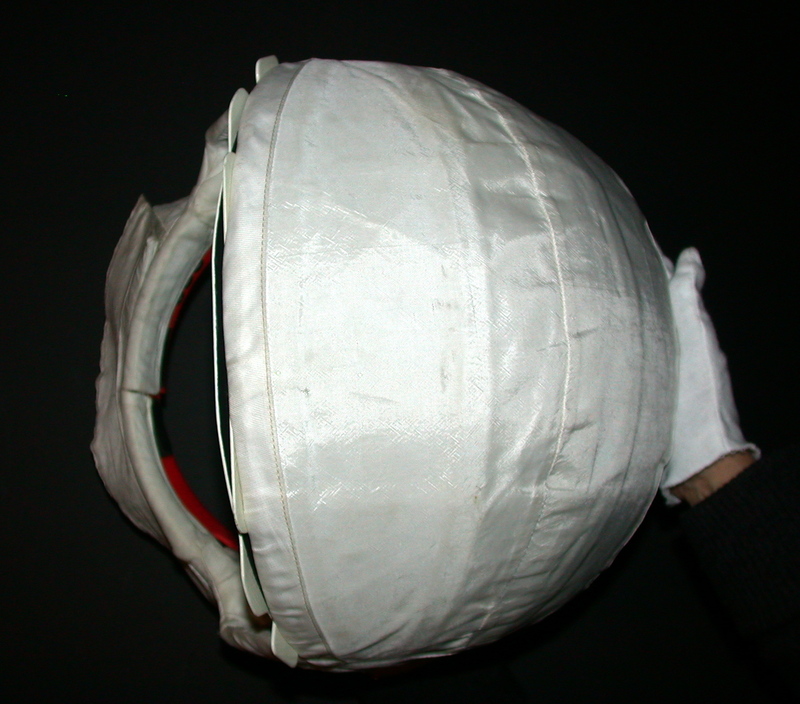 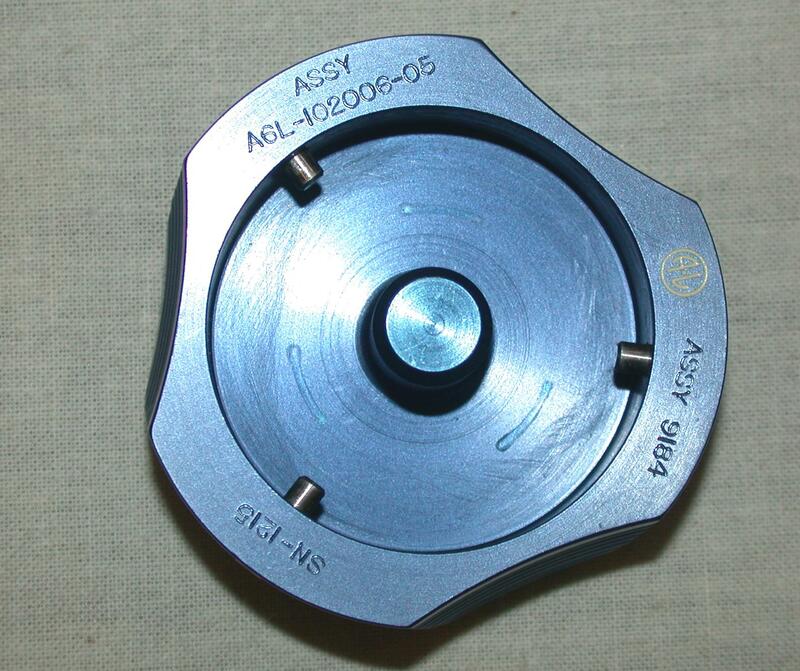 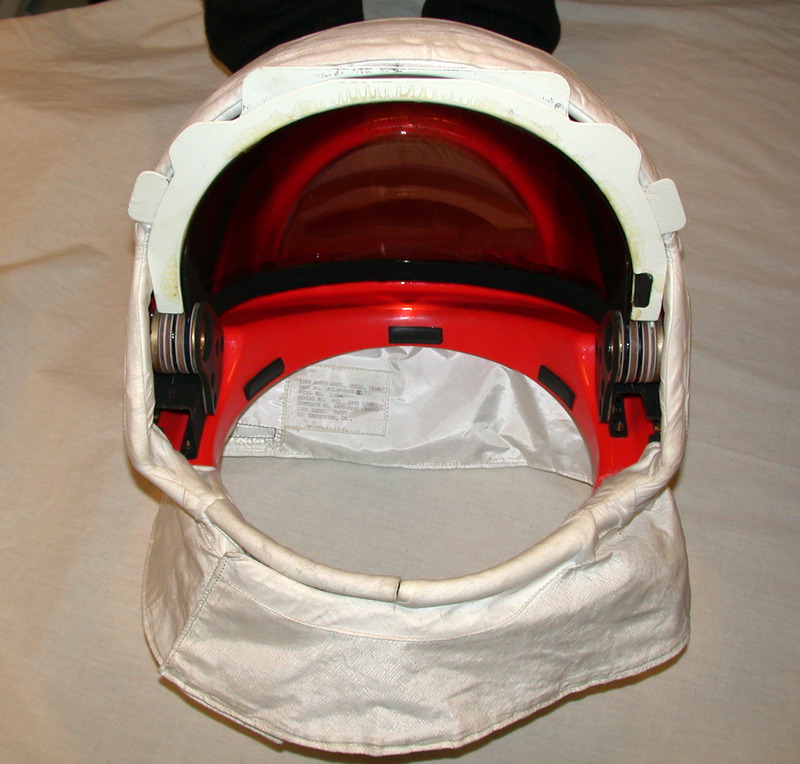 Detail from 16-mm frame showing Neil's LEVA during the EVA. 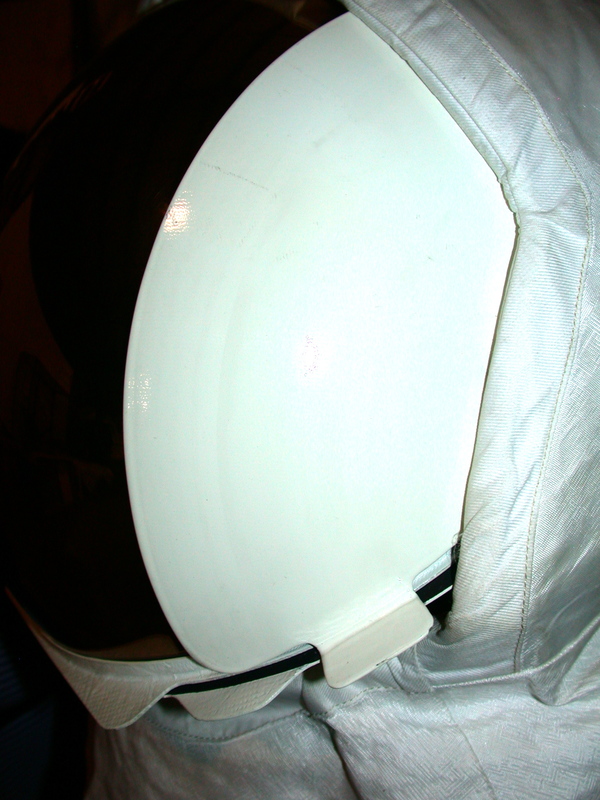 His sun visor and both sunshades are up. 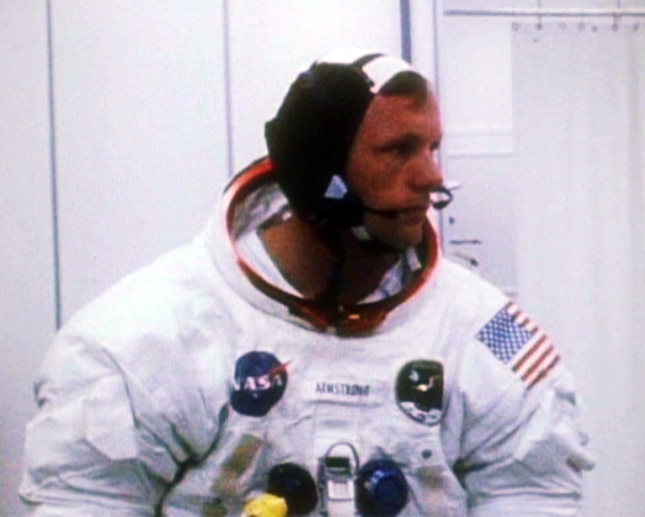 Frame from NASA motion picture shot during suit-up. 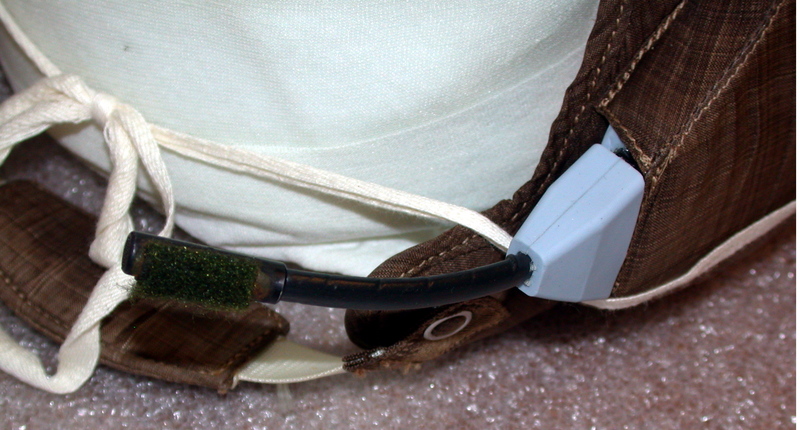 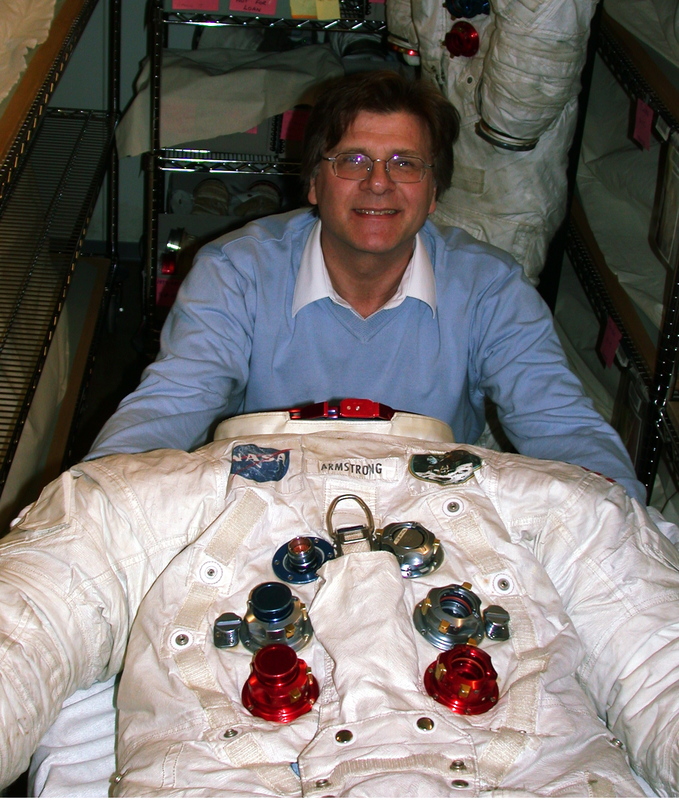 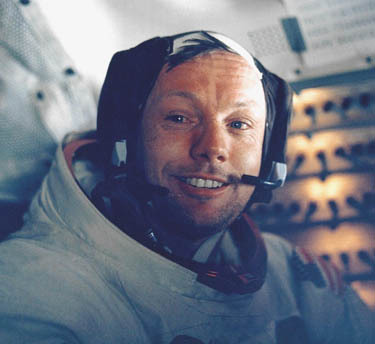 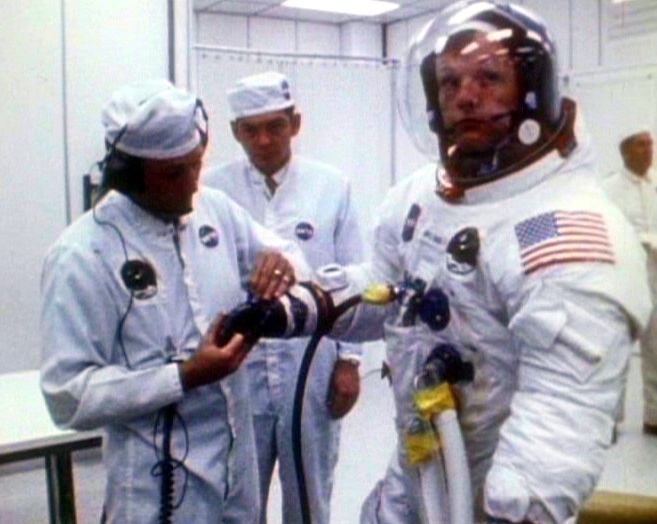 Neil with his right arm extended during suit-up, showing the pressure gauge. 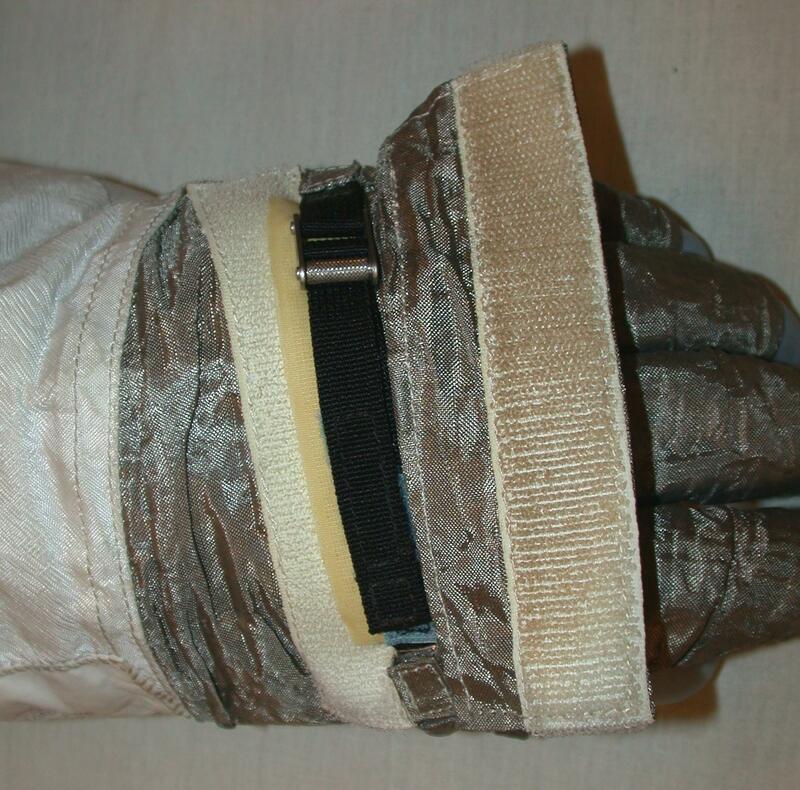 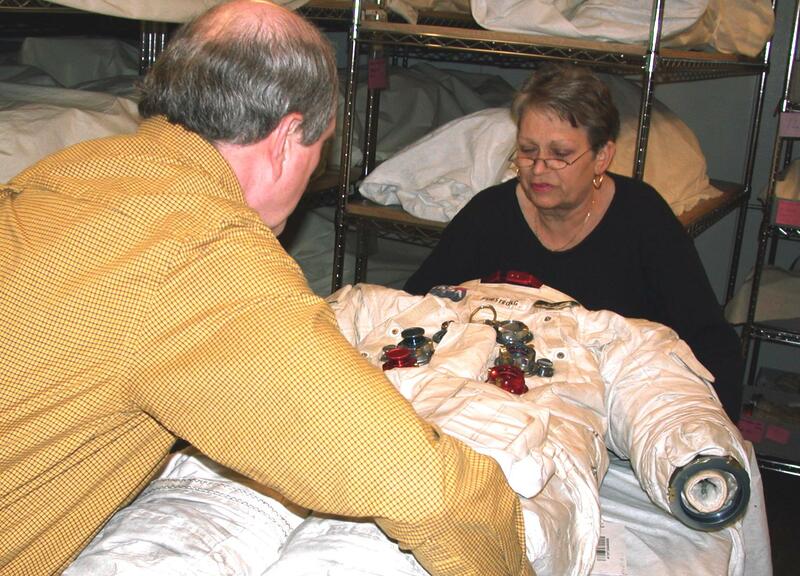 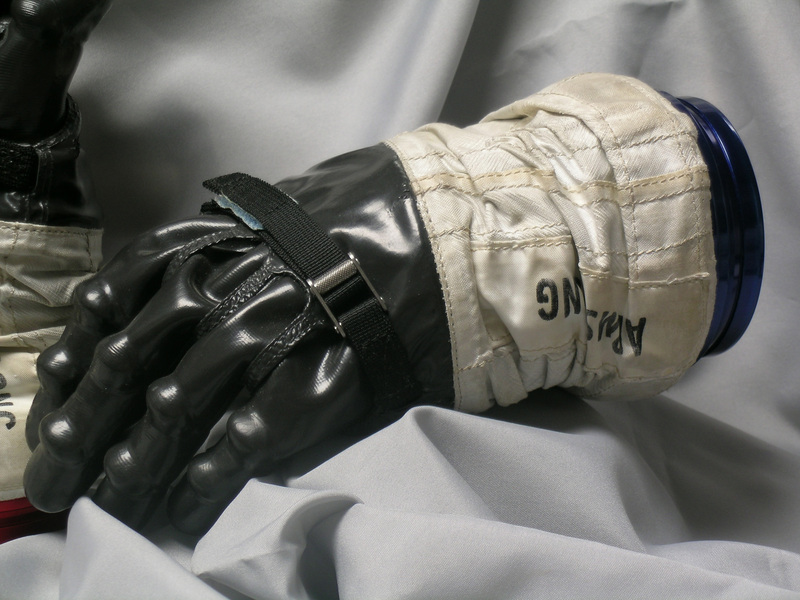 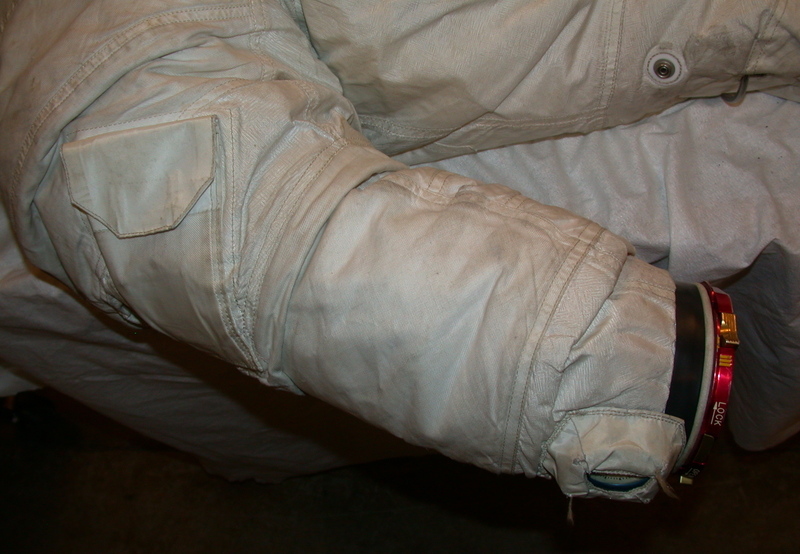 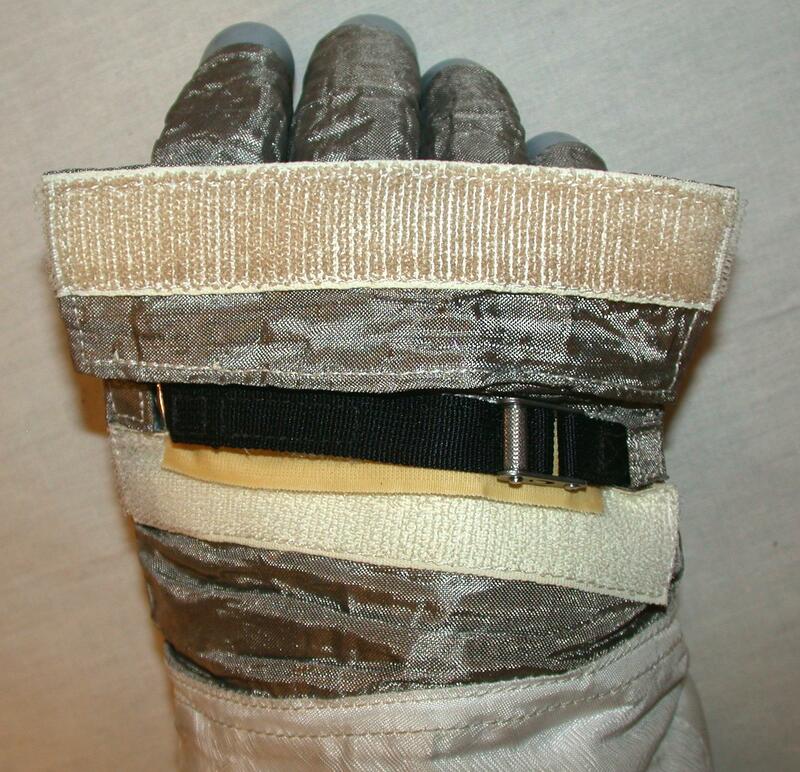 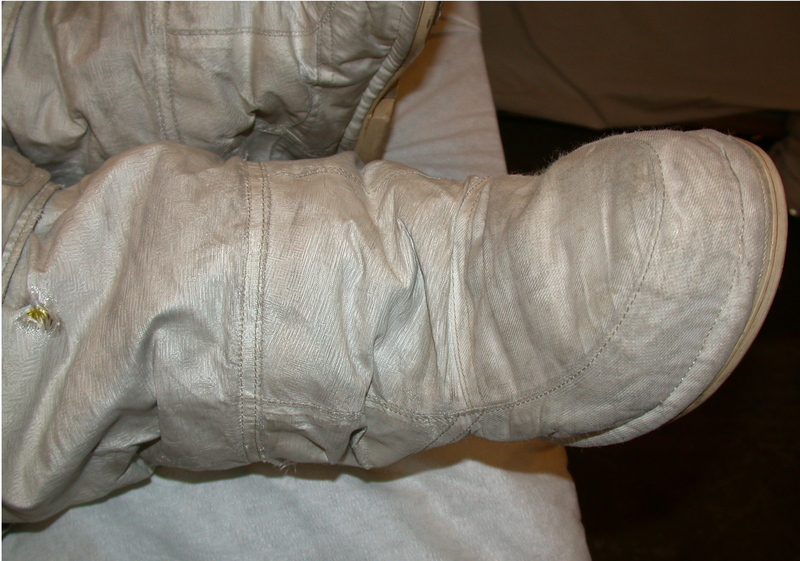 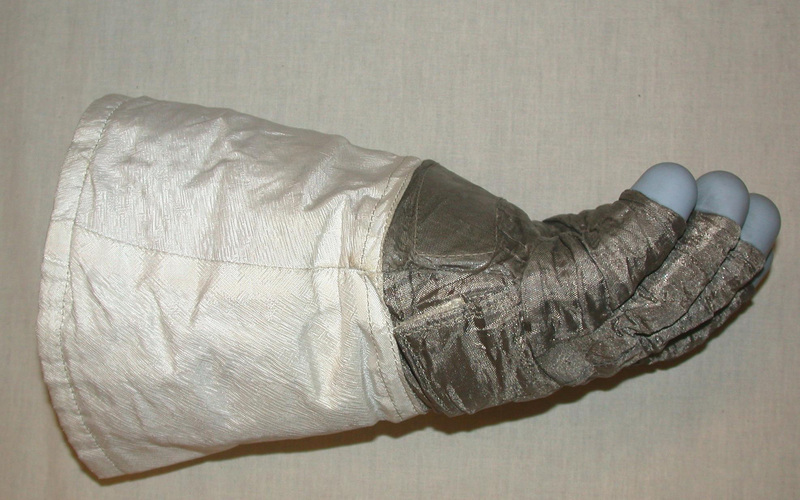 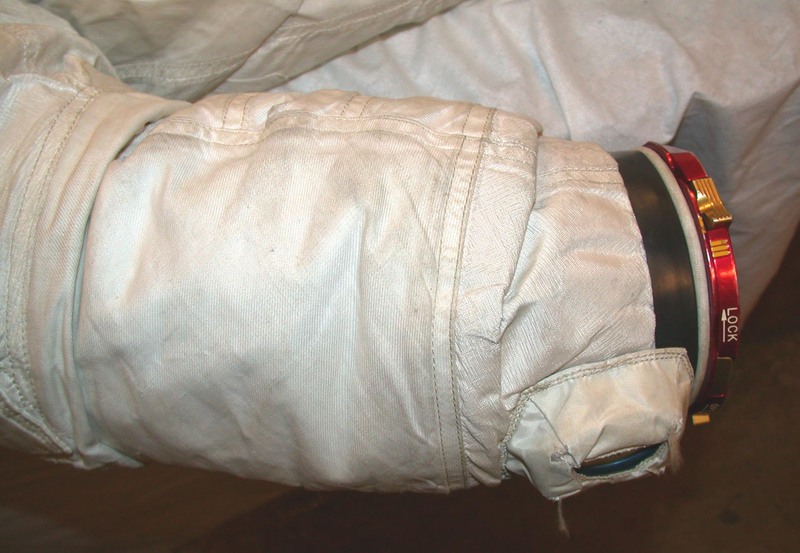 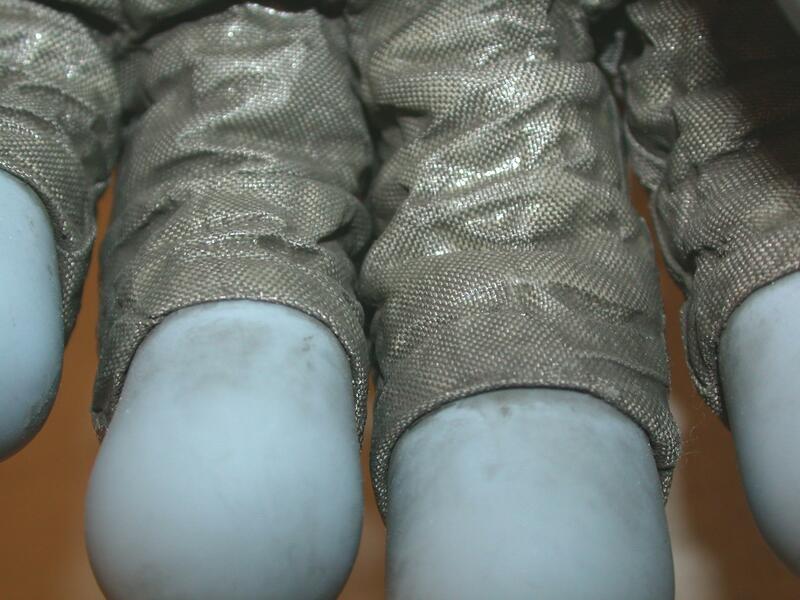 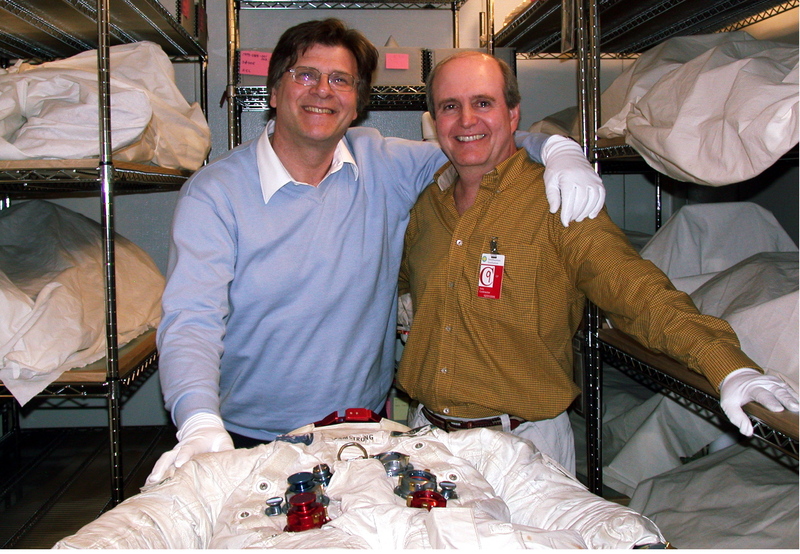 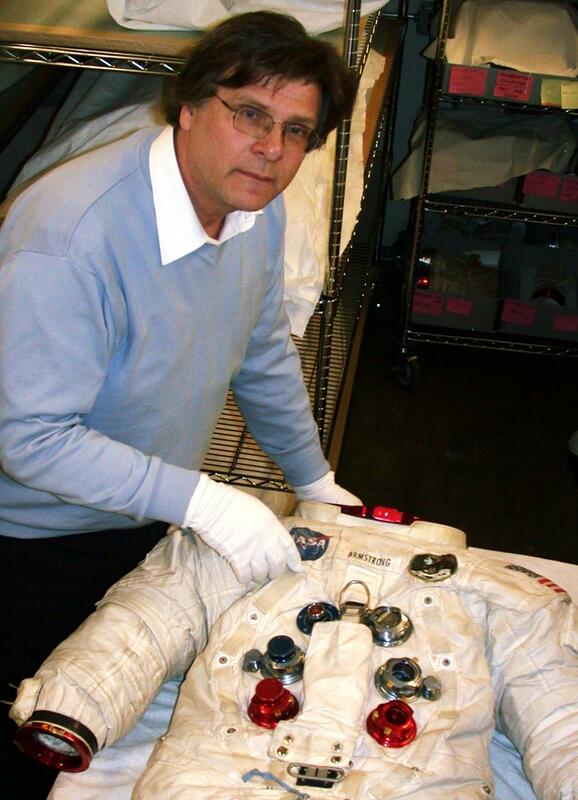 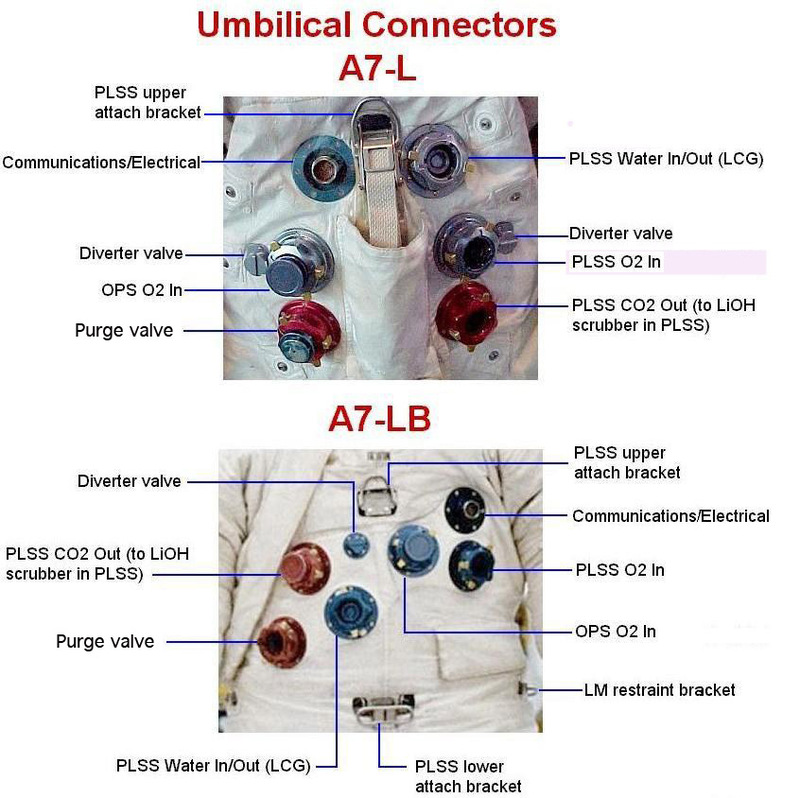 A suit tech is fitting Neil's Intravehicular (IV) glove. 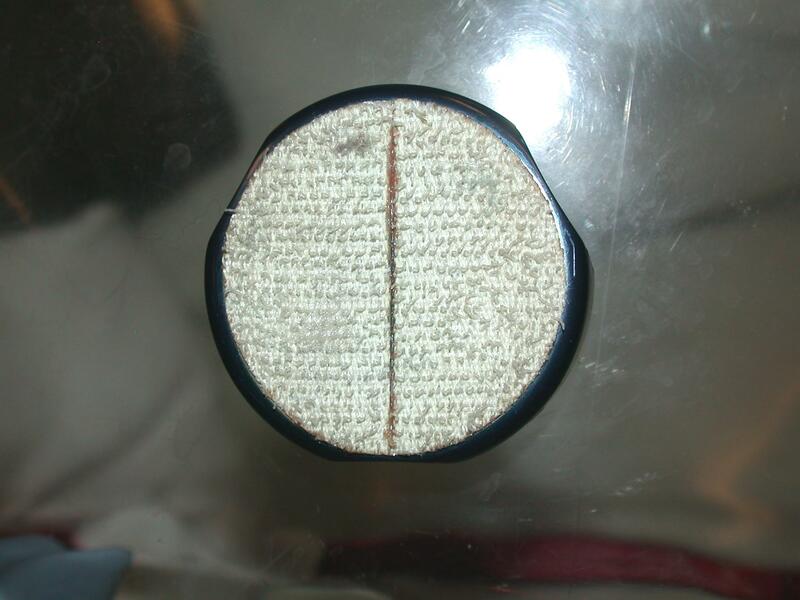 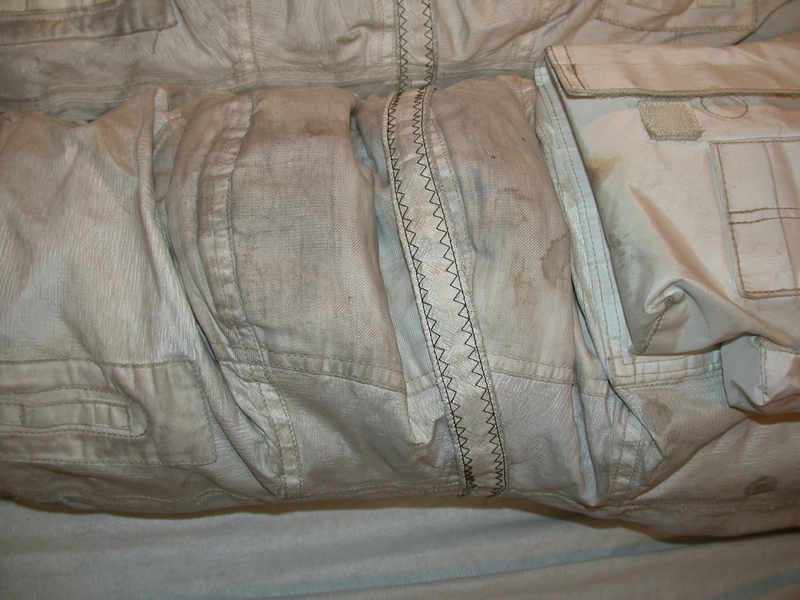 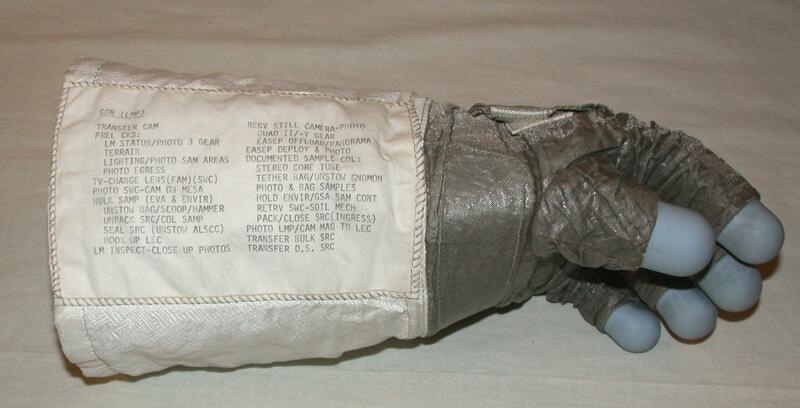 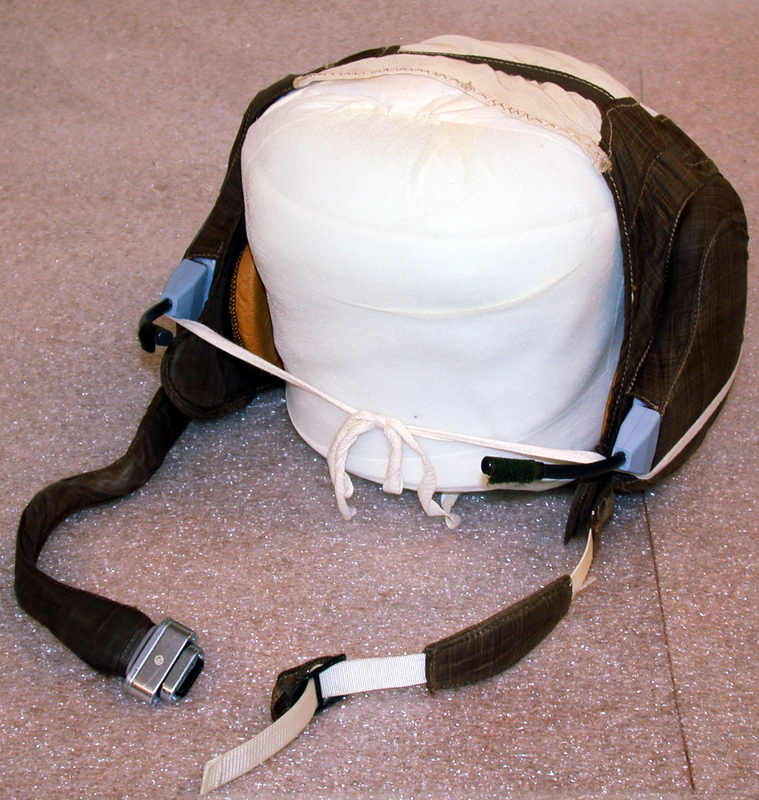 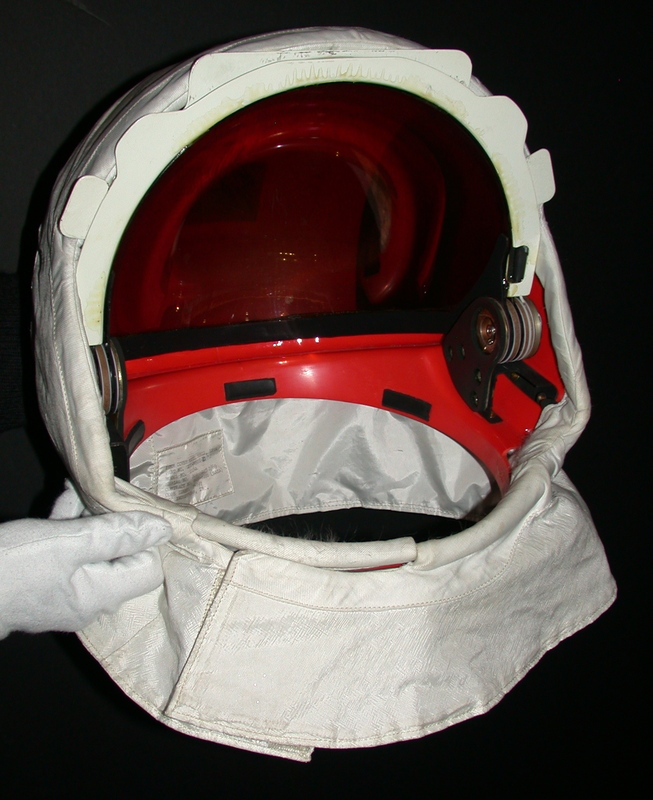 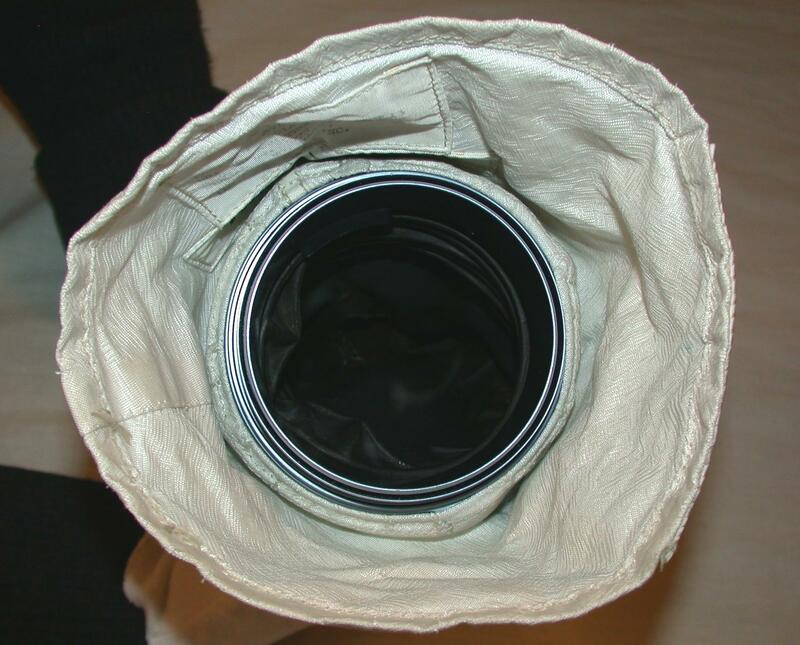 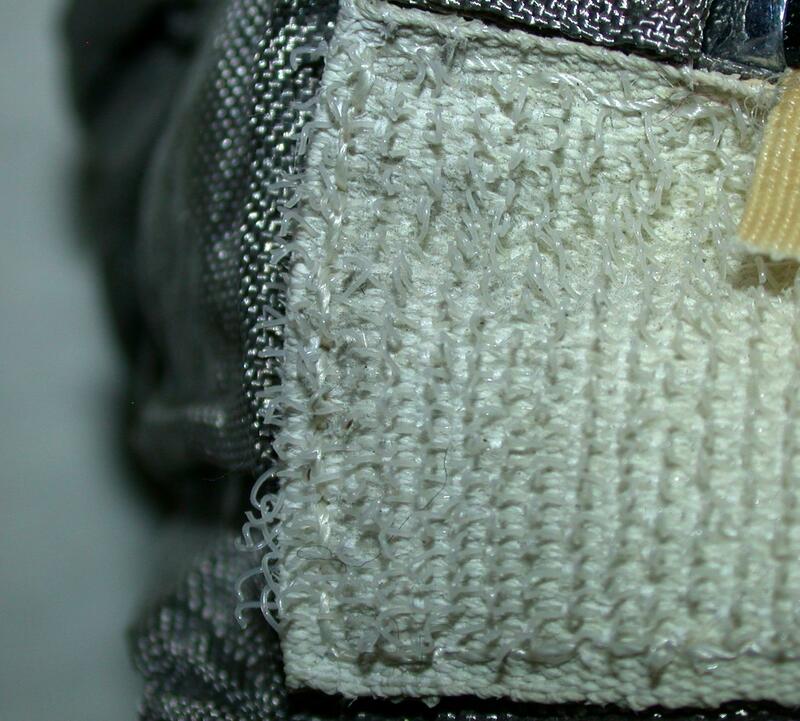 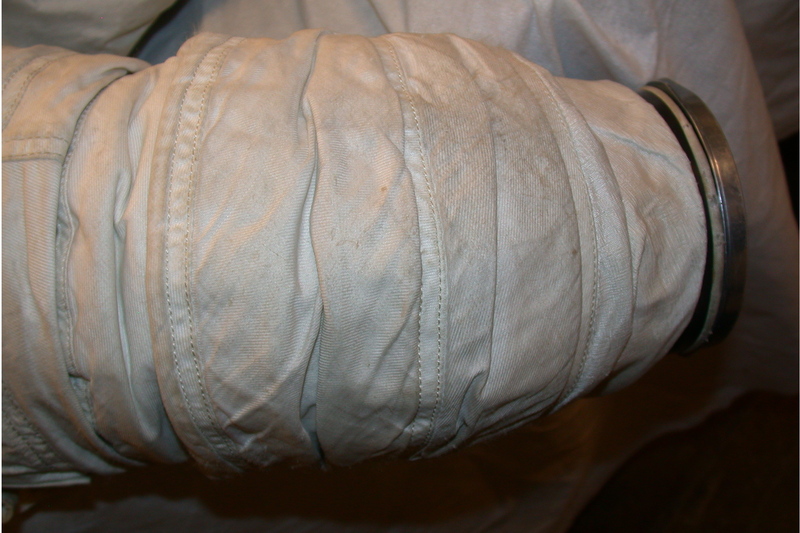 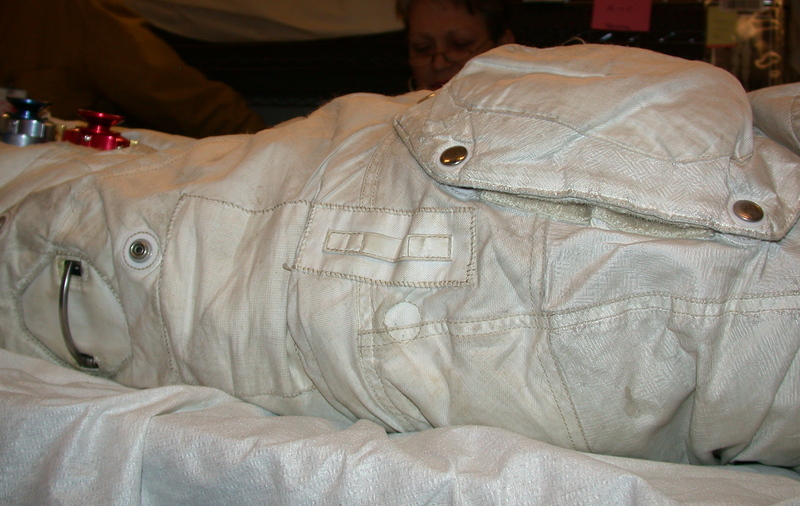 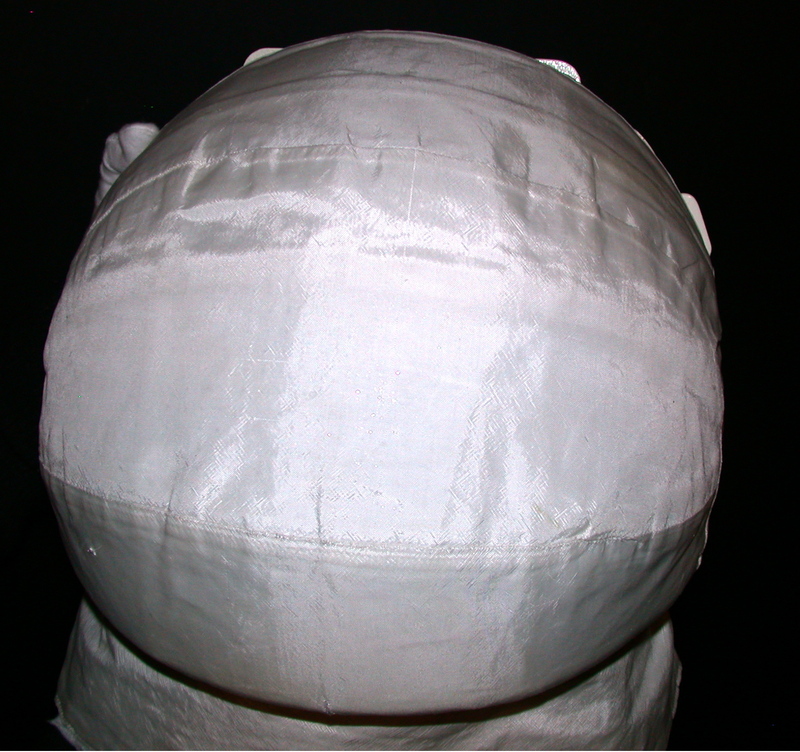 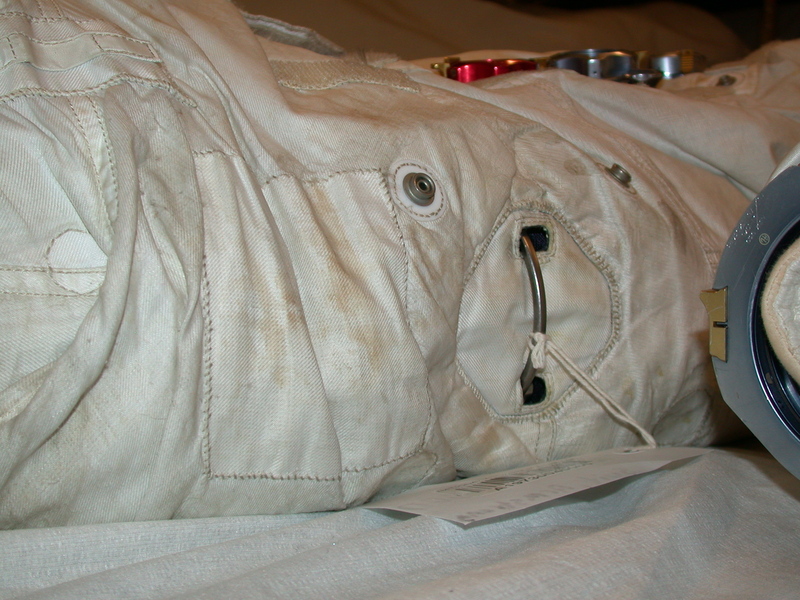 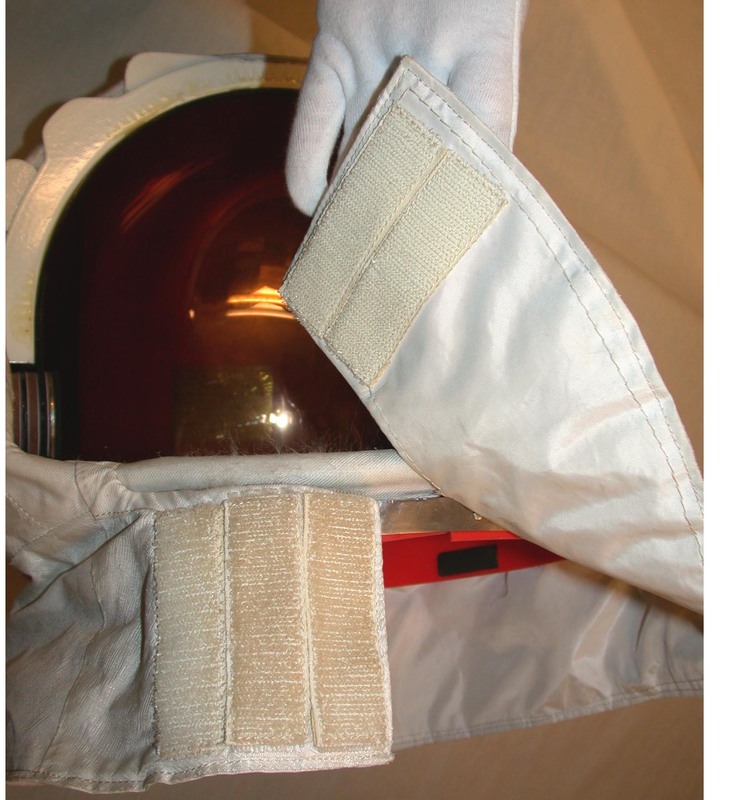 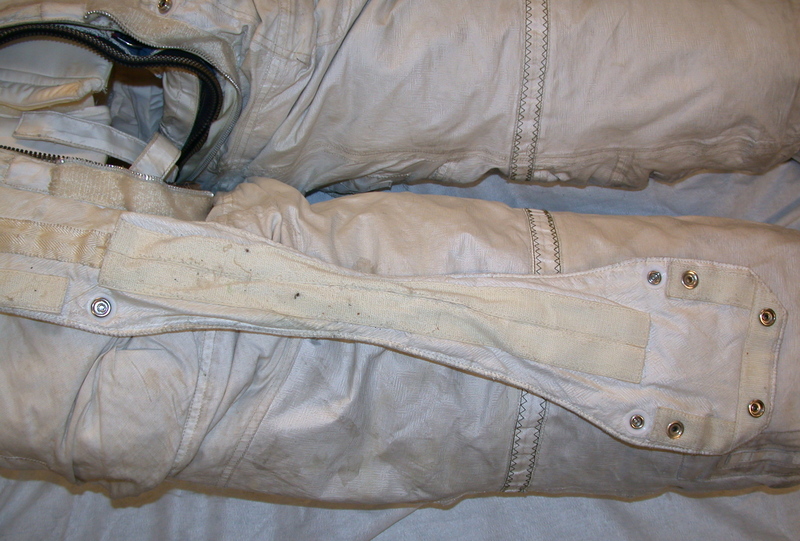 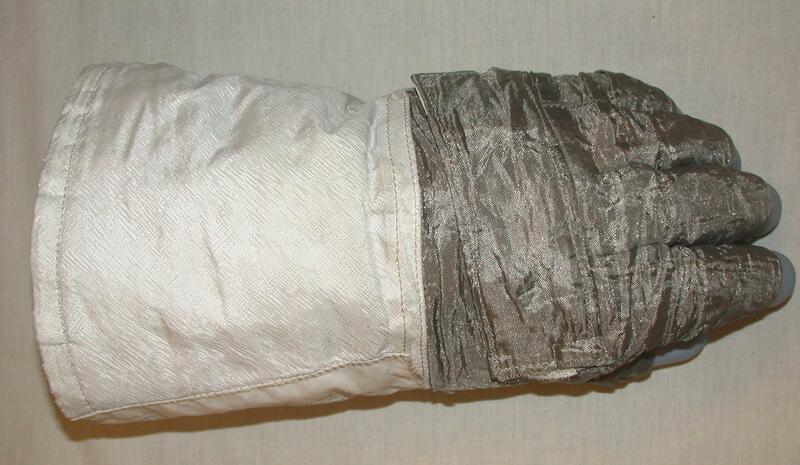 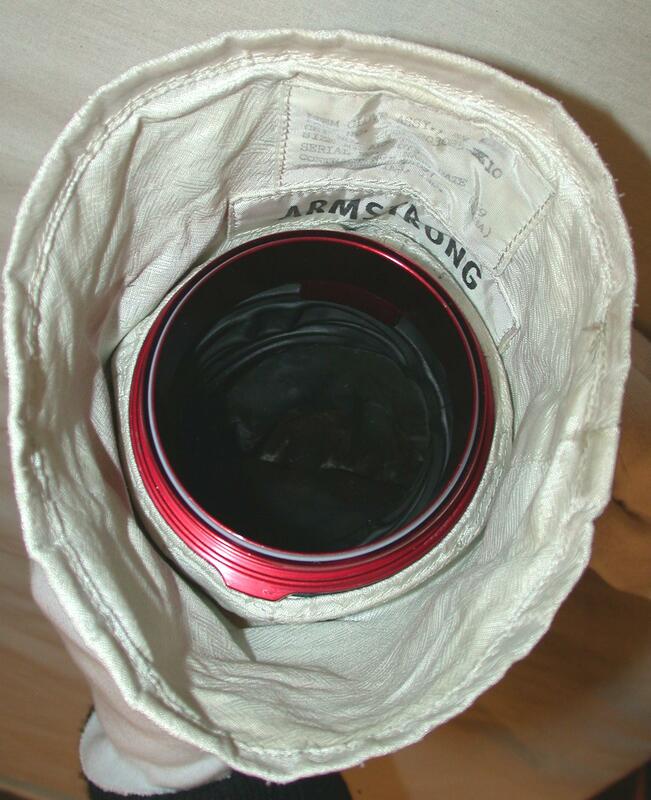 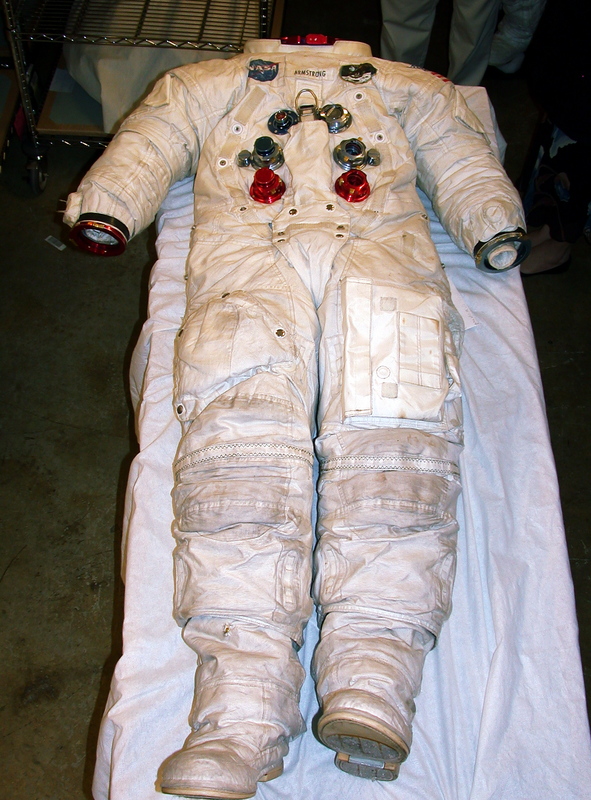 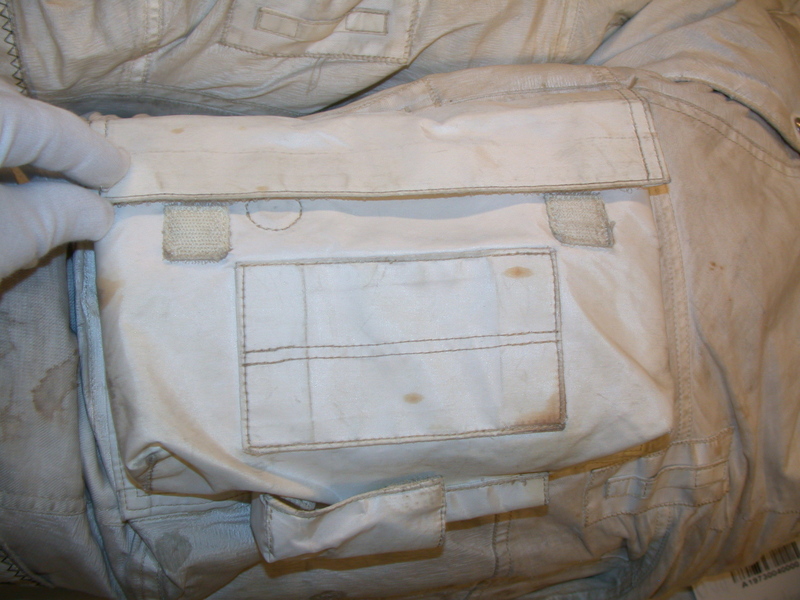 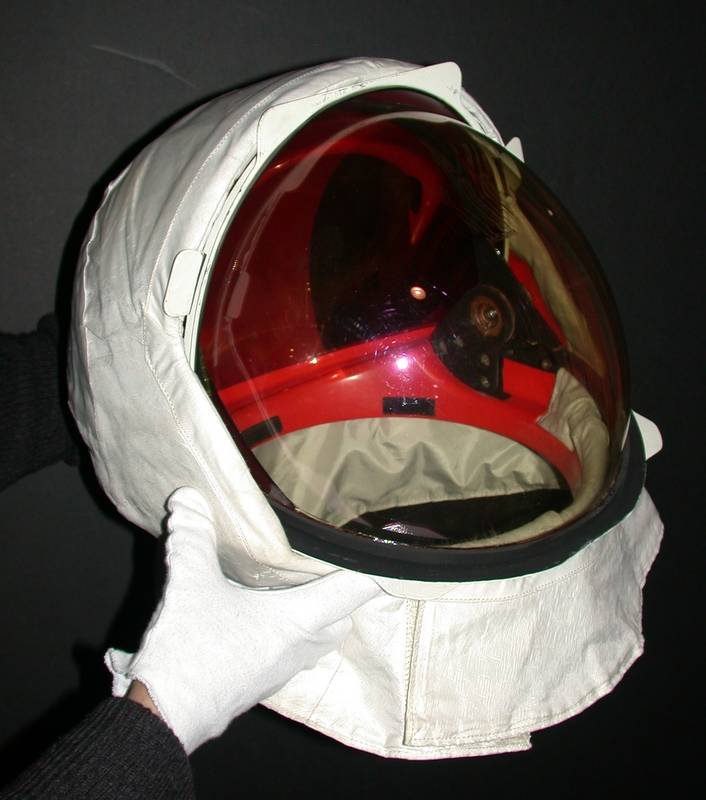 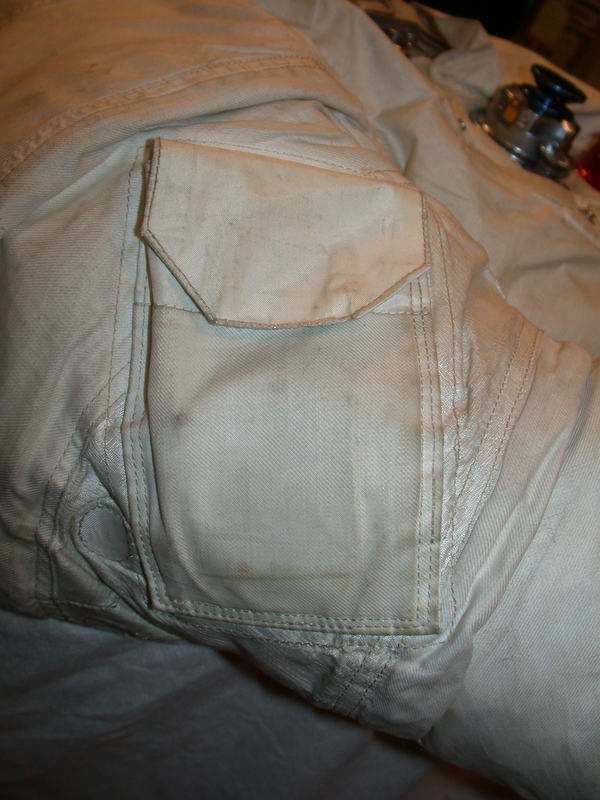 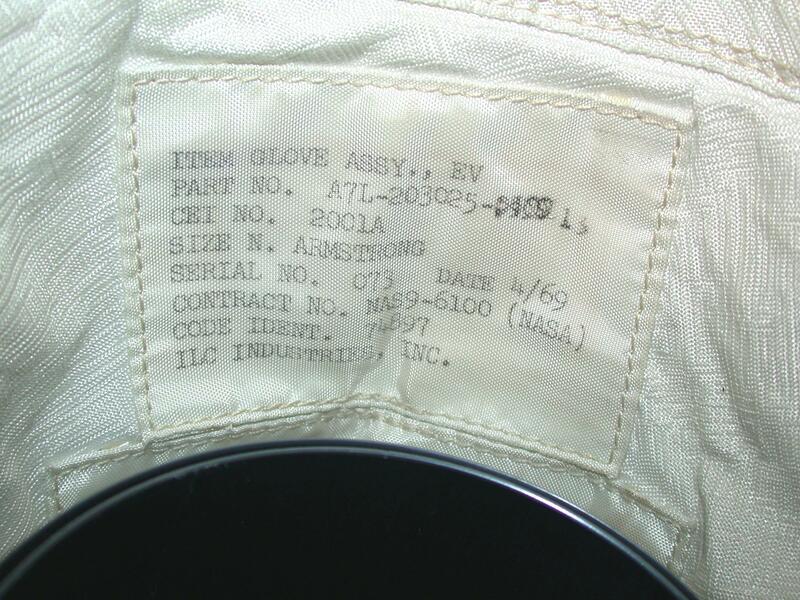 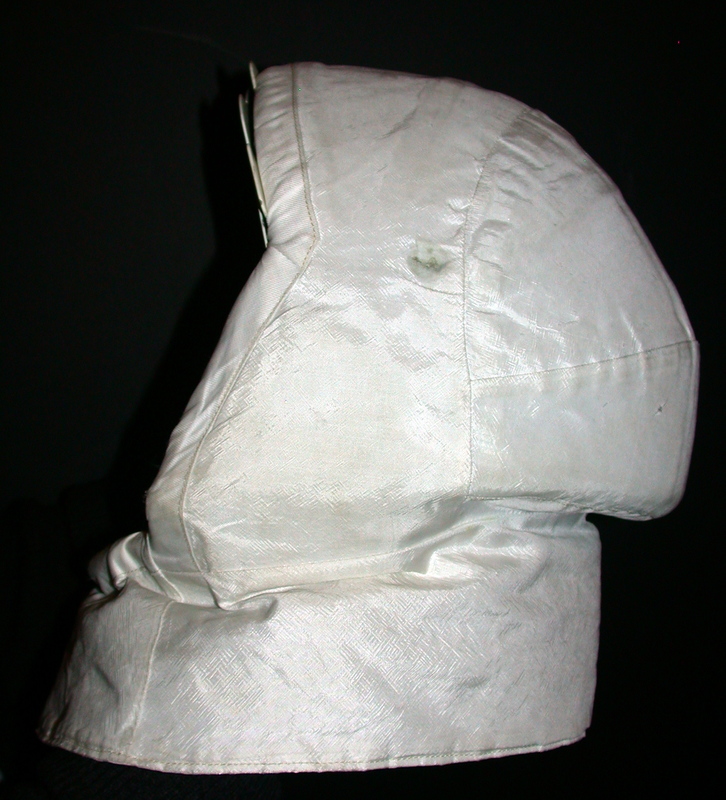 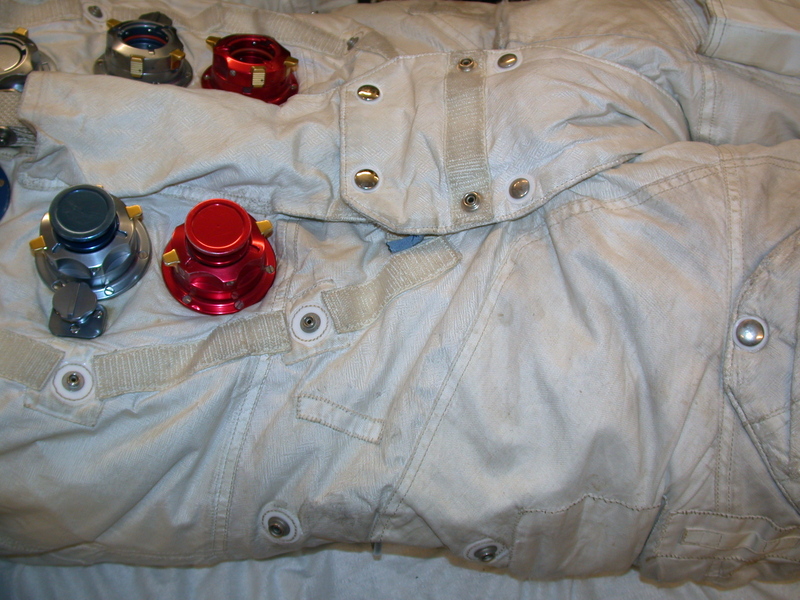 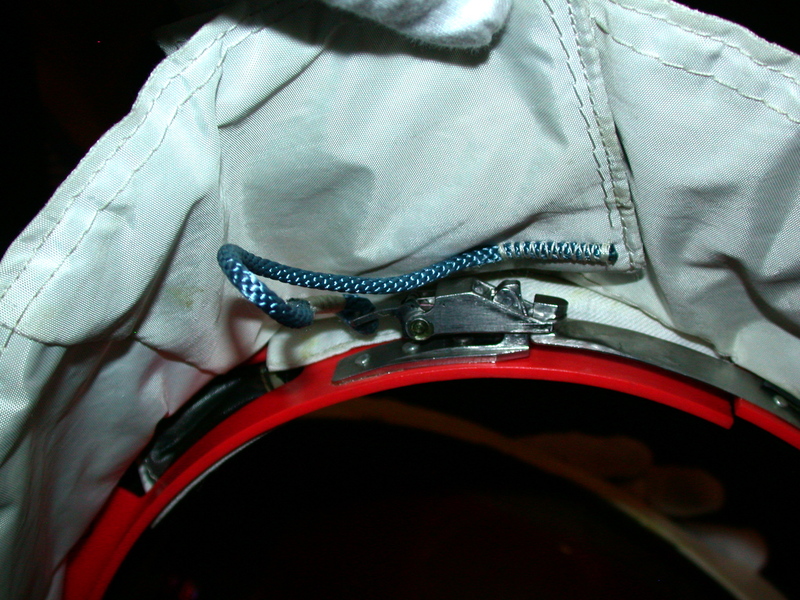 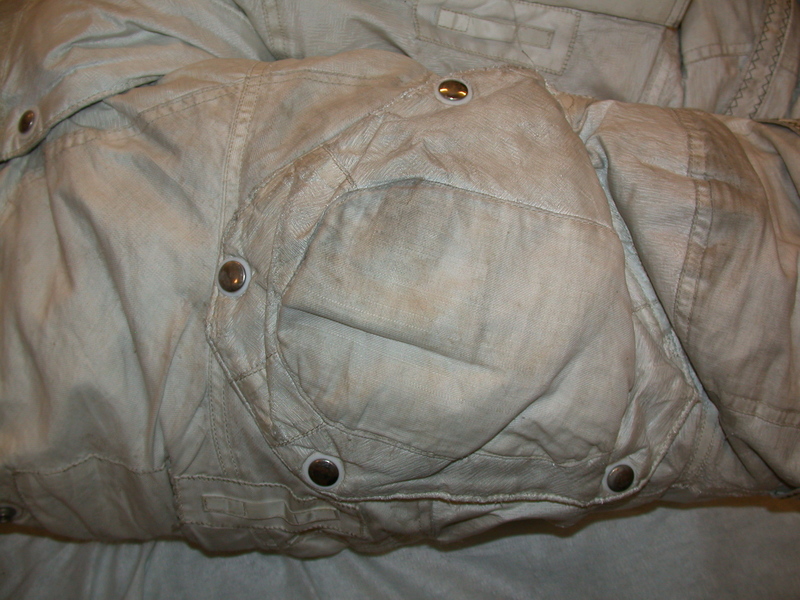 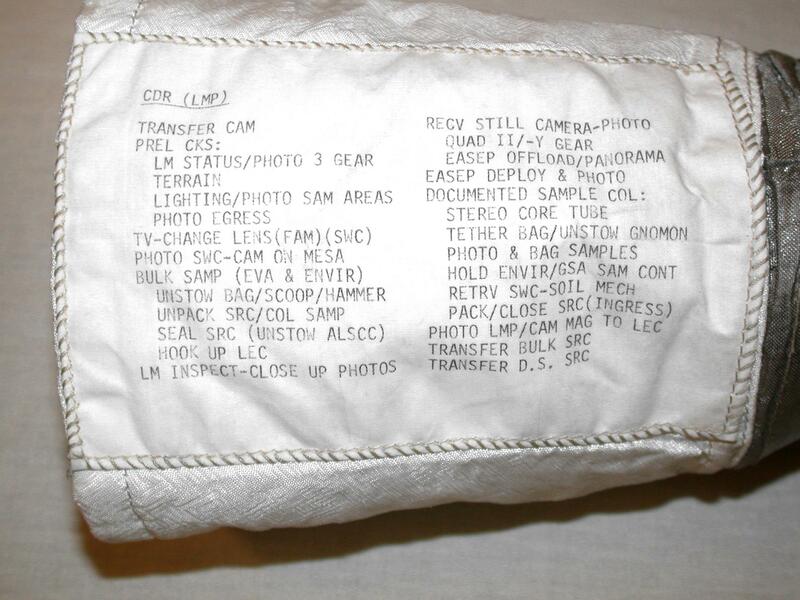 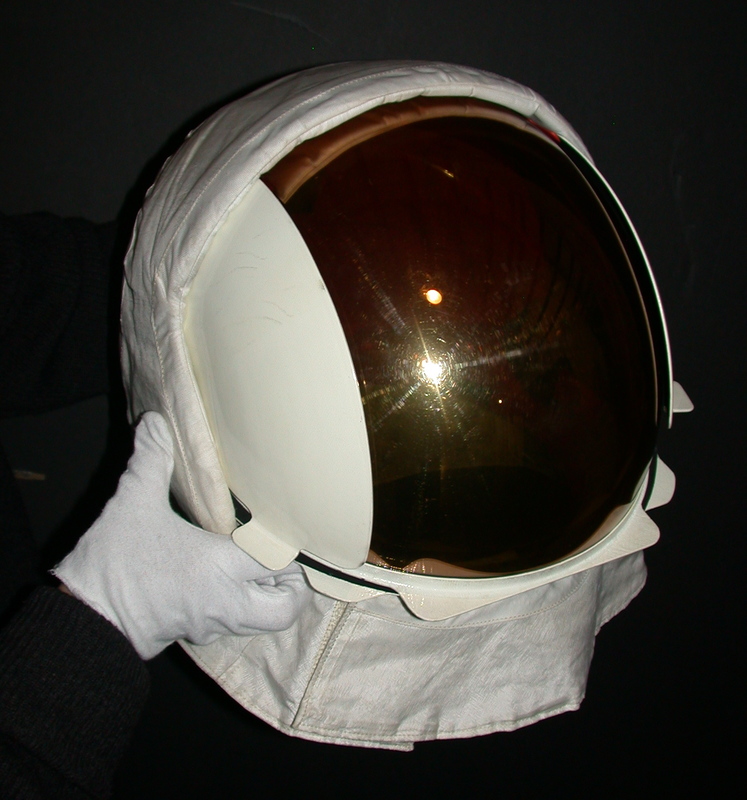 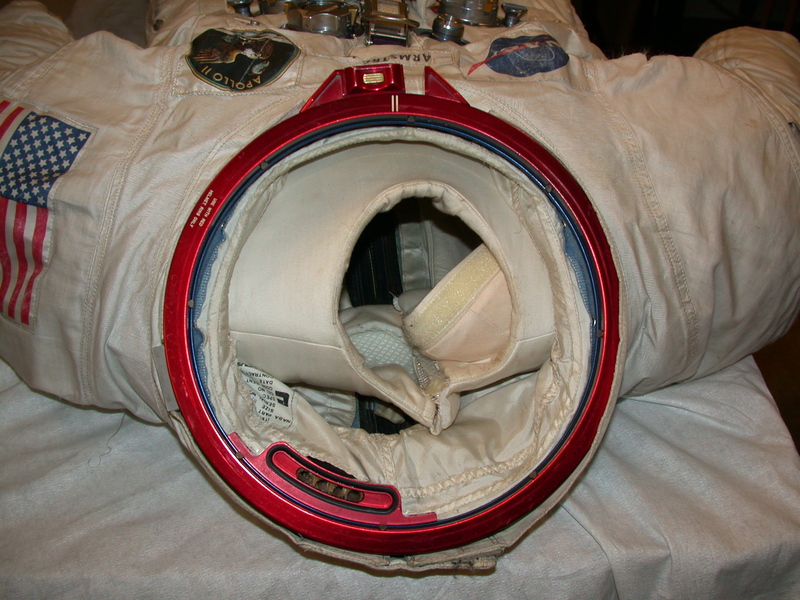 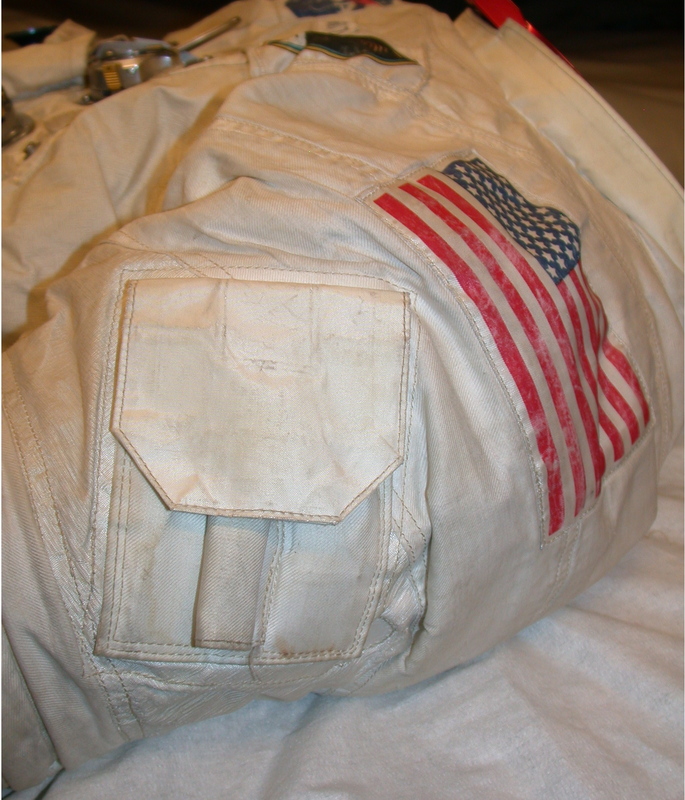 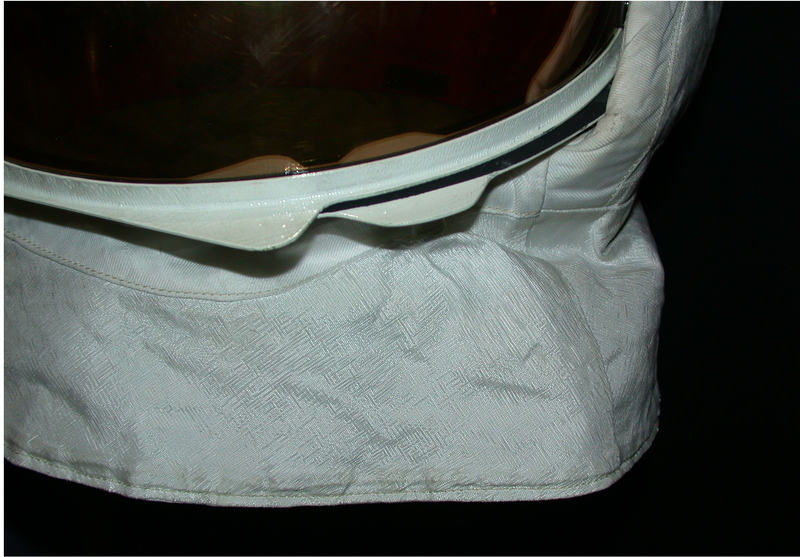 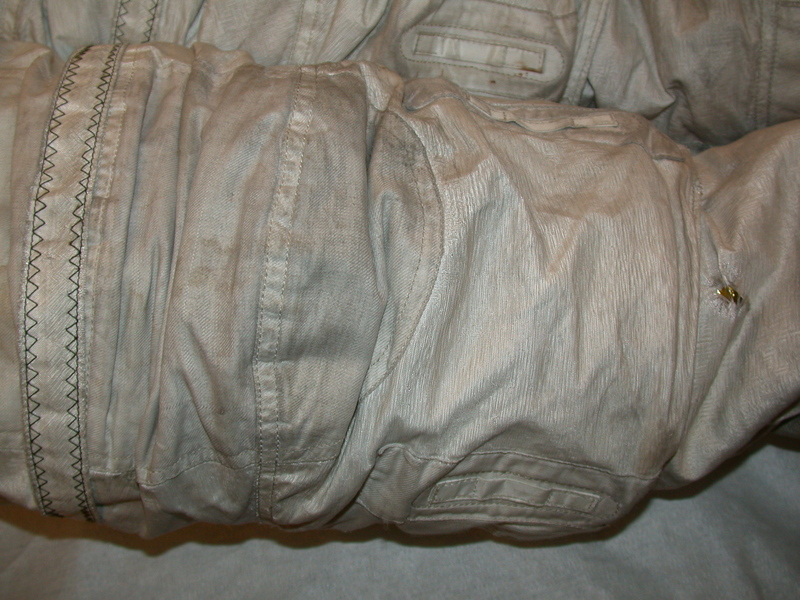 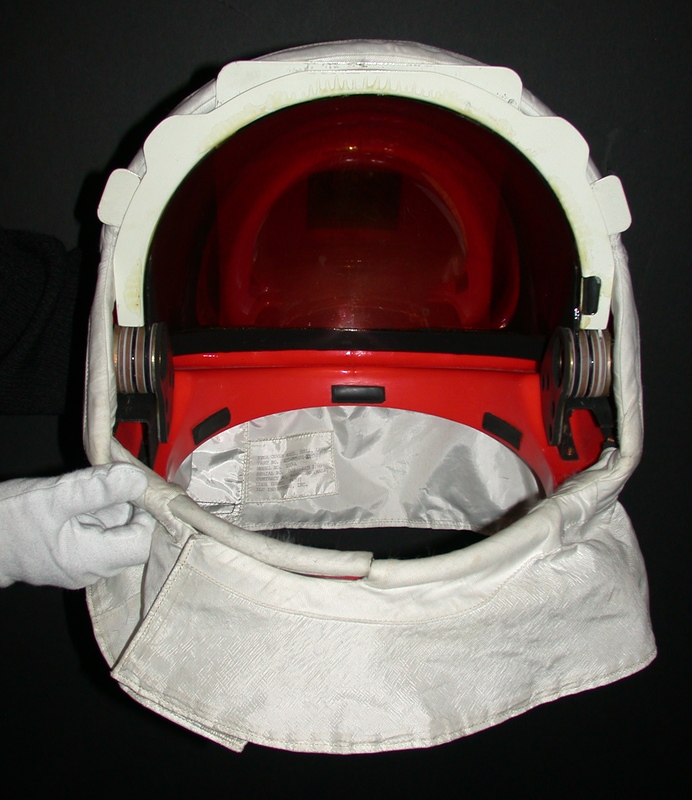 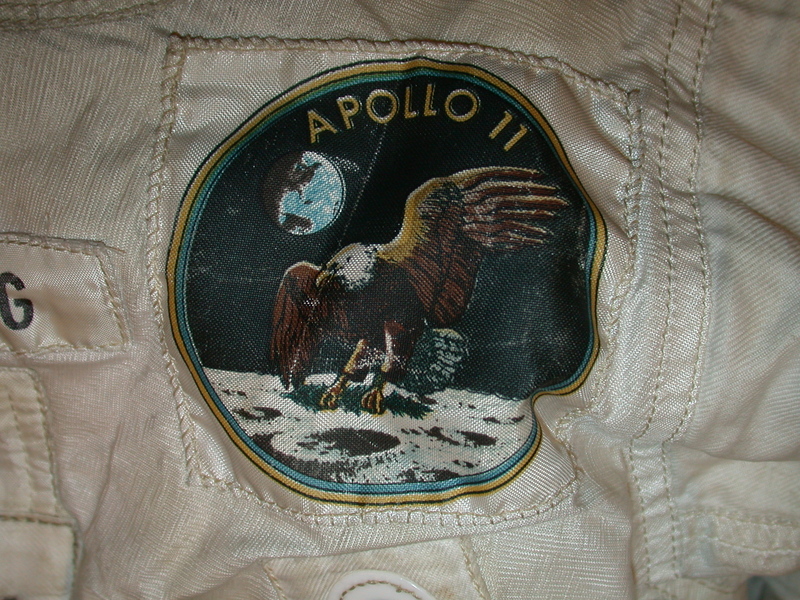 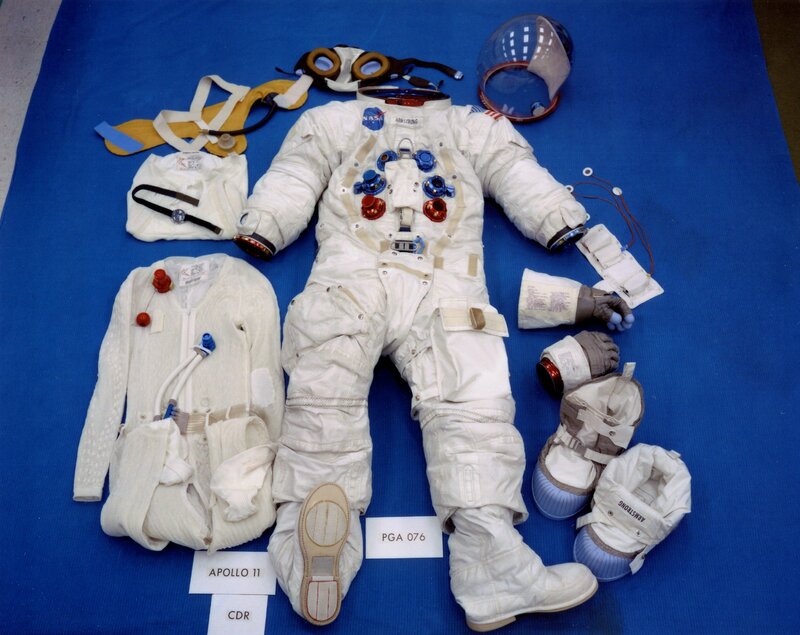 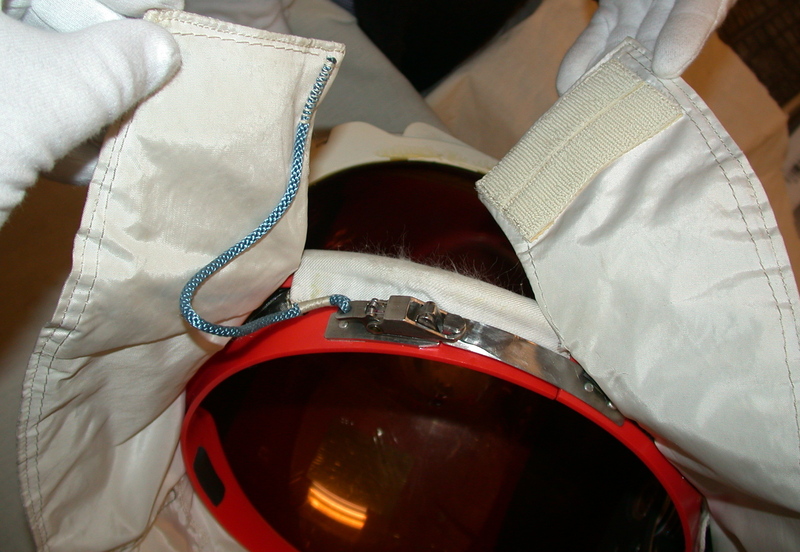 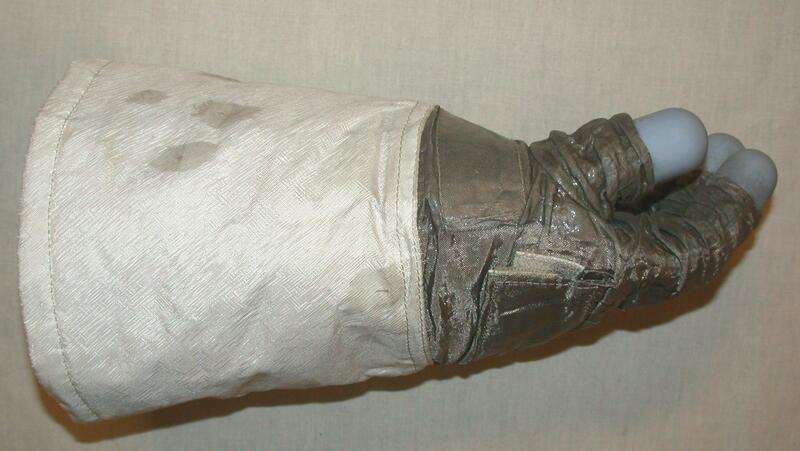 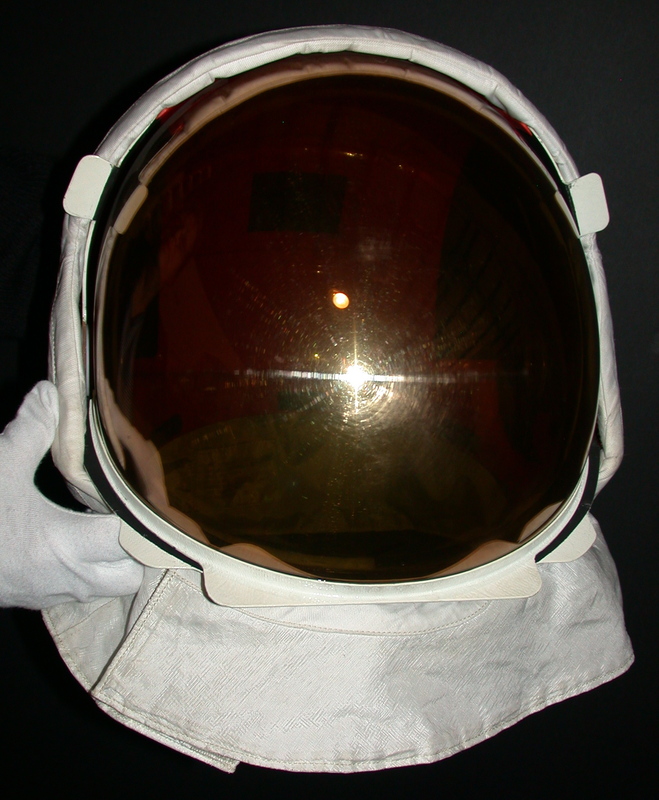 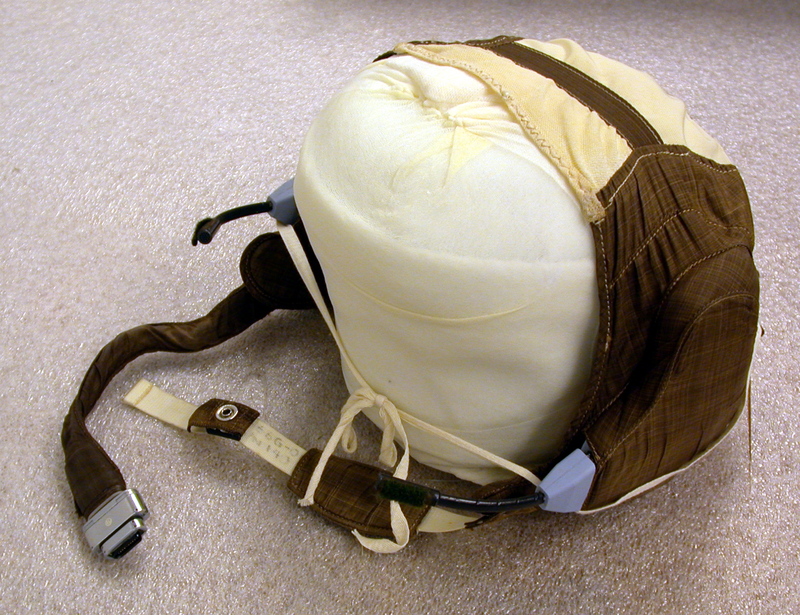 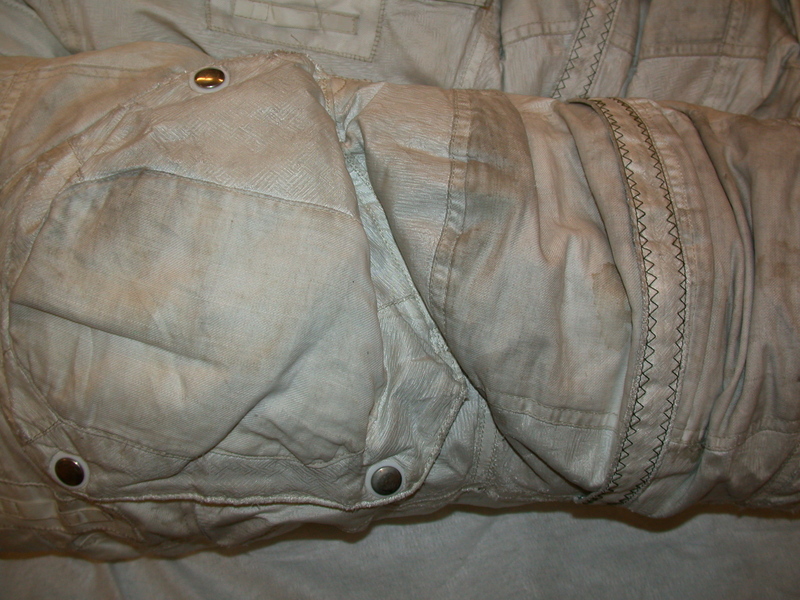 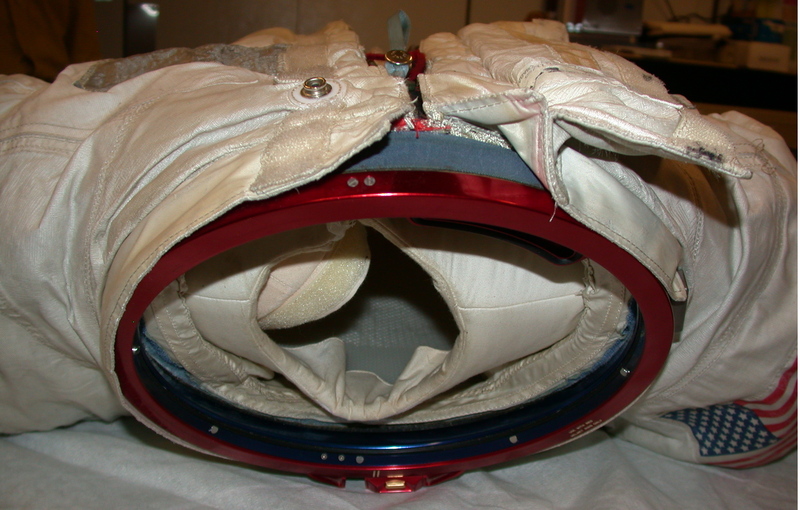 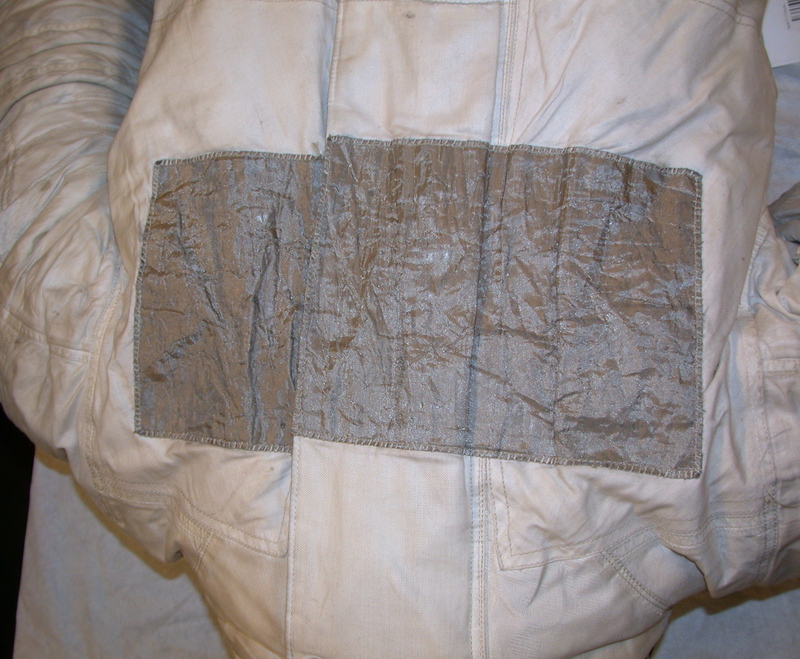 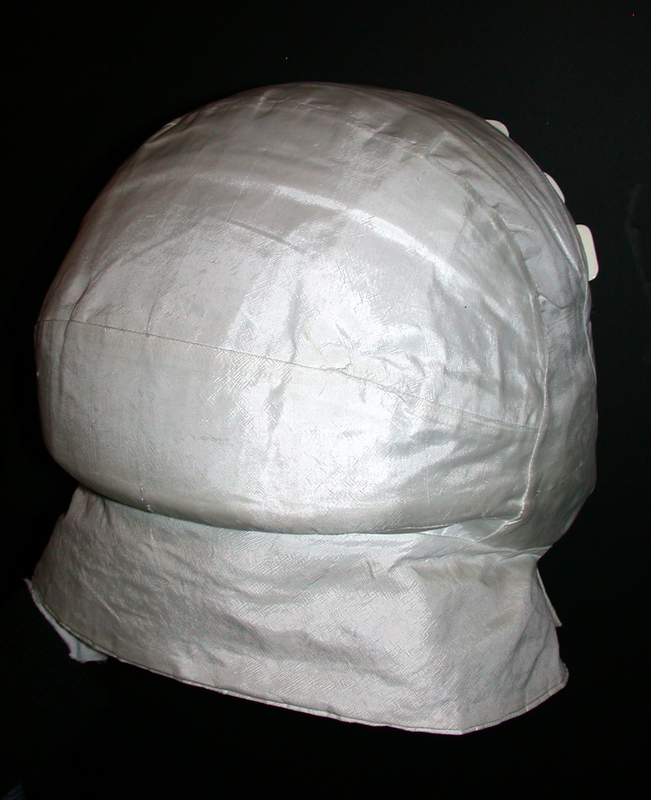 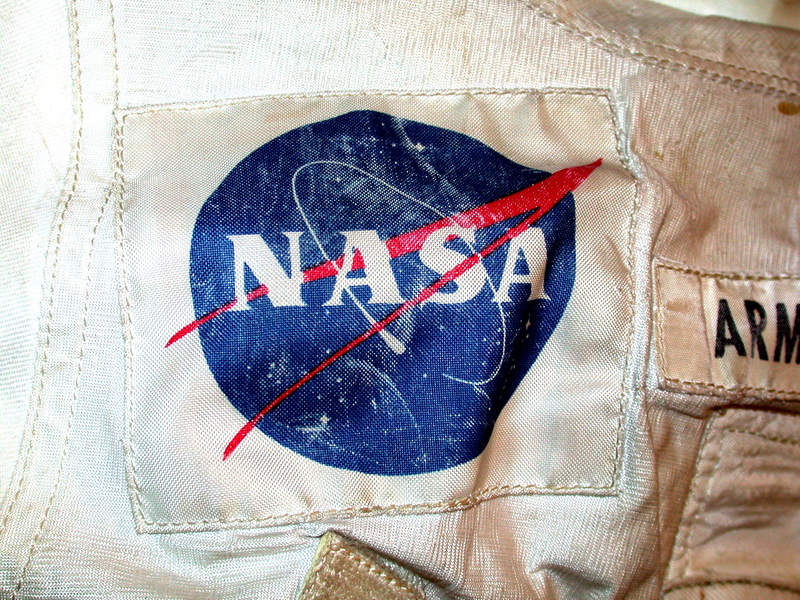 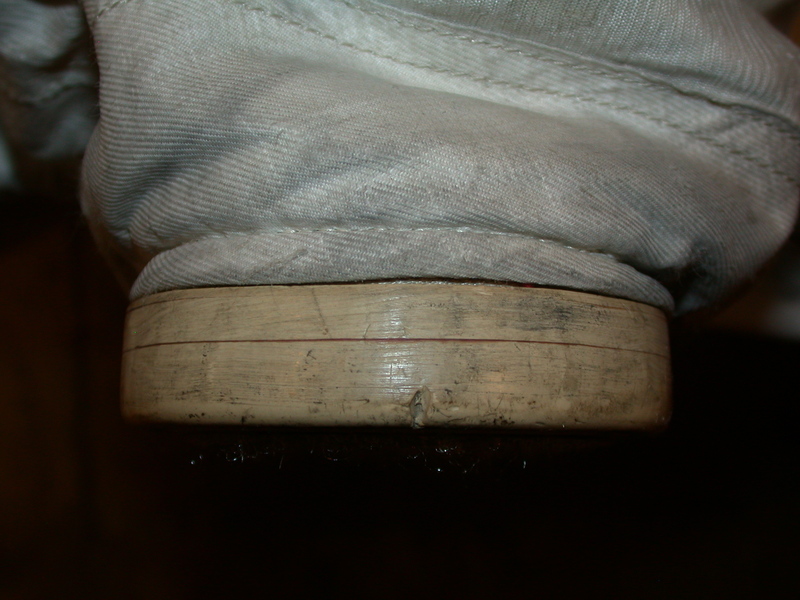 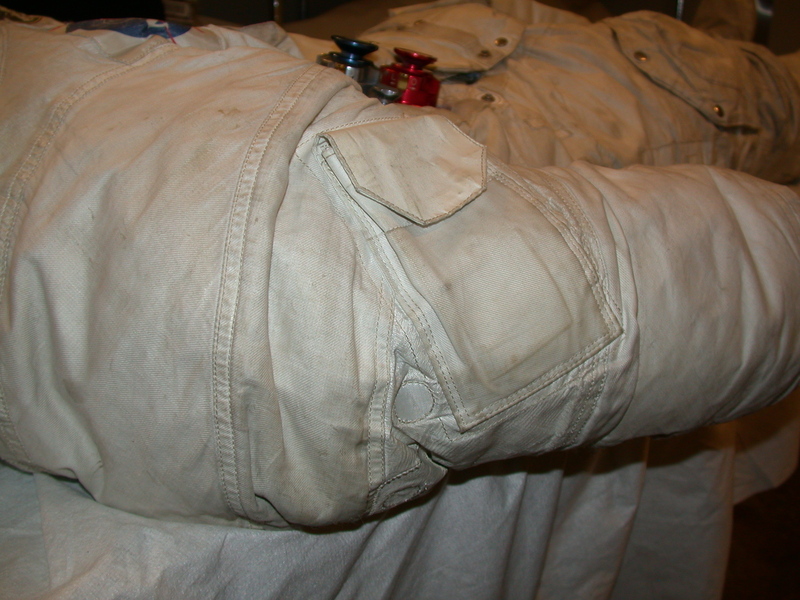 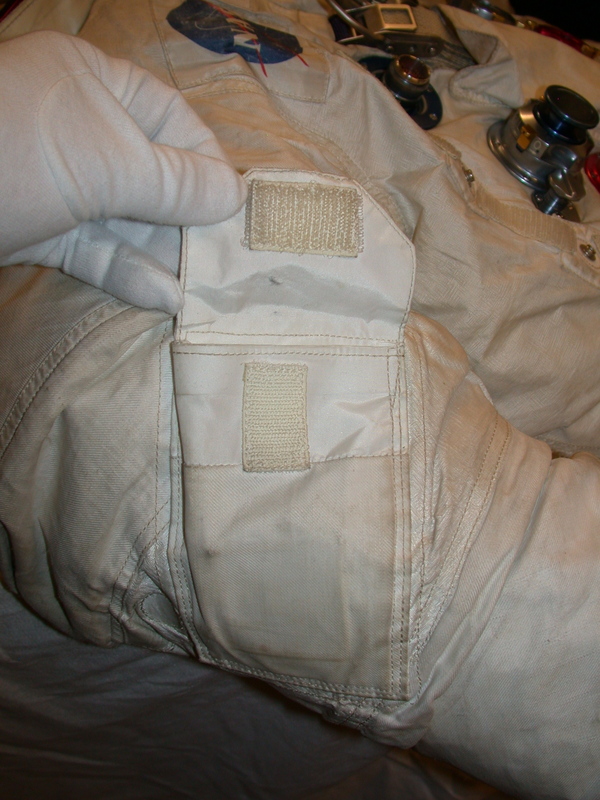 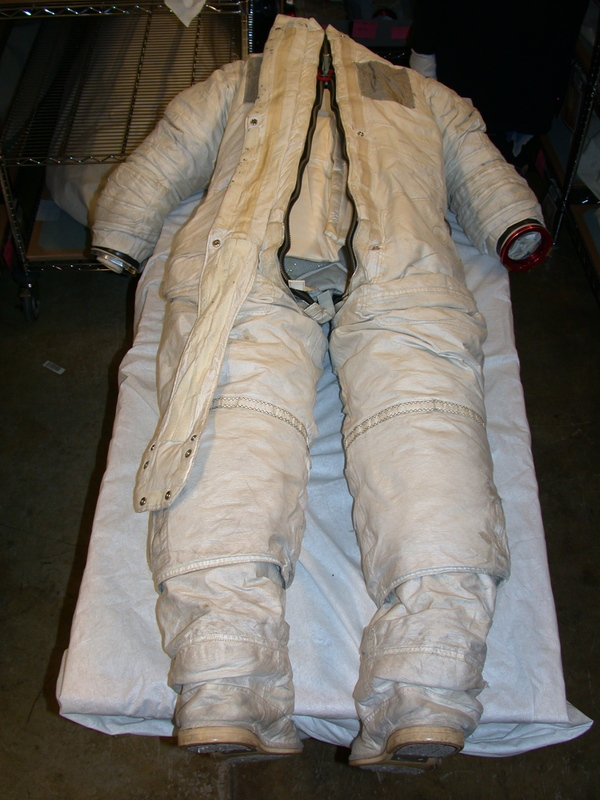 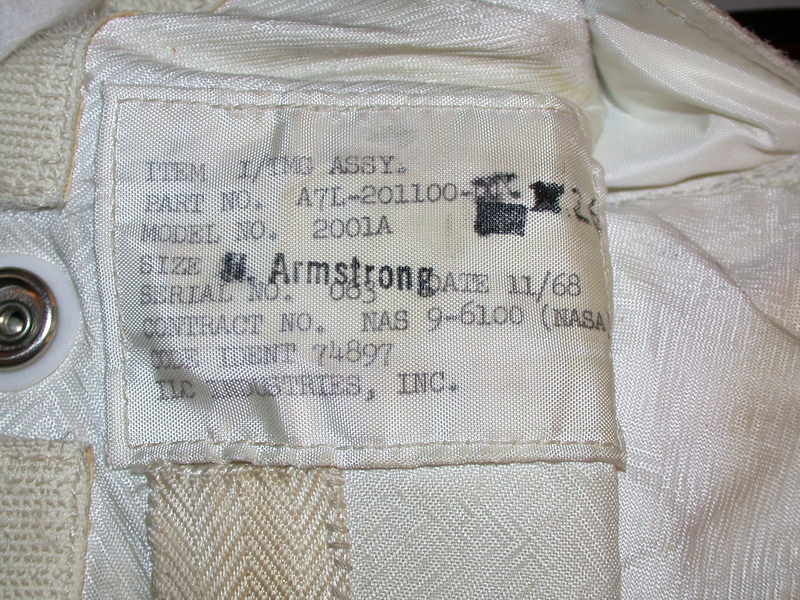 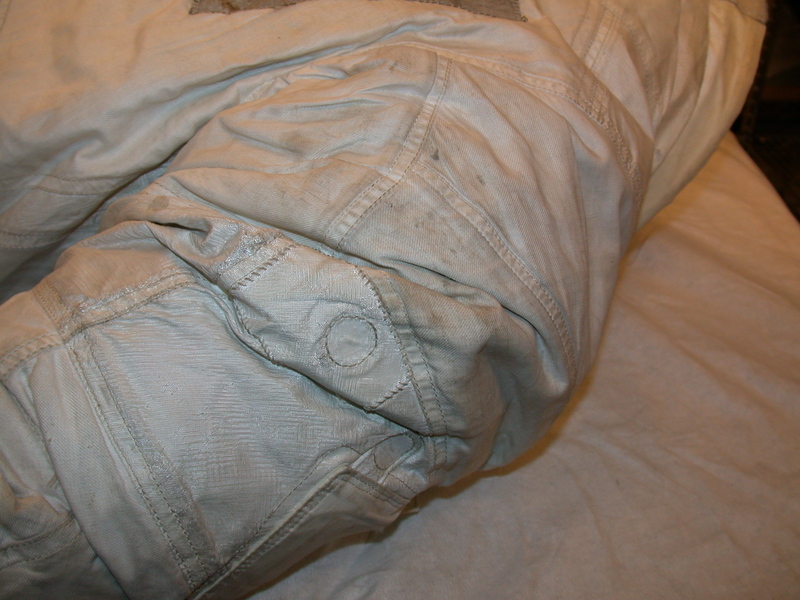 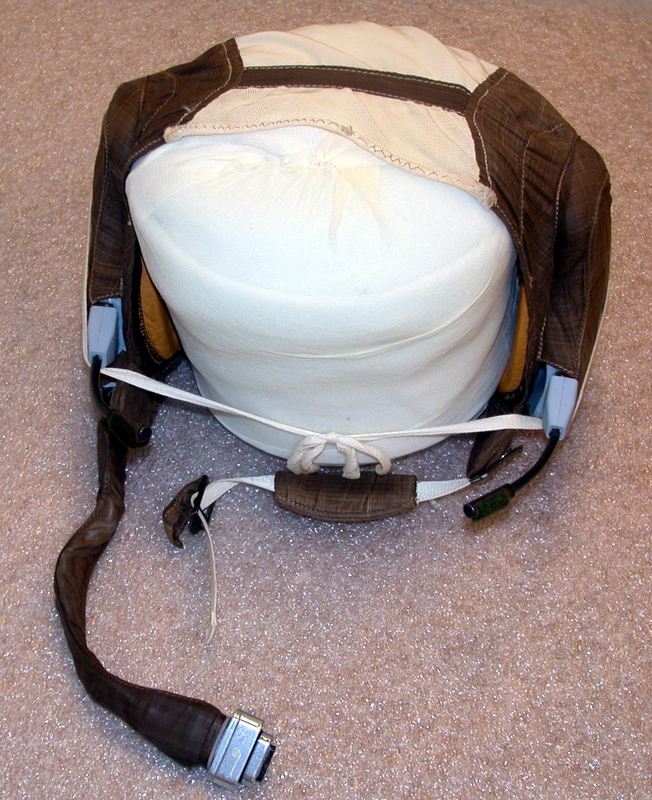 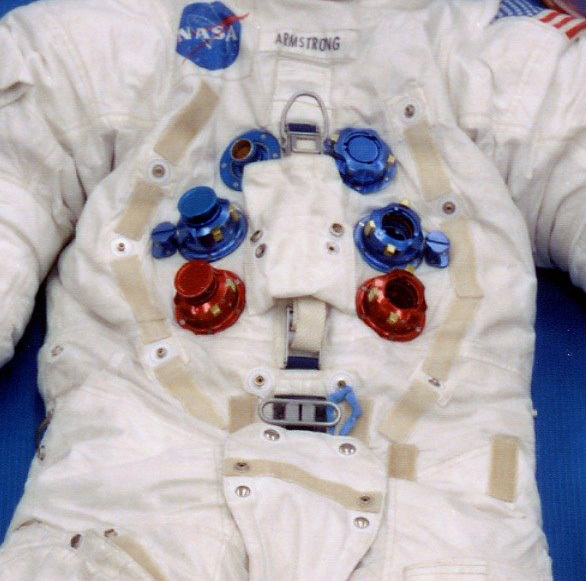 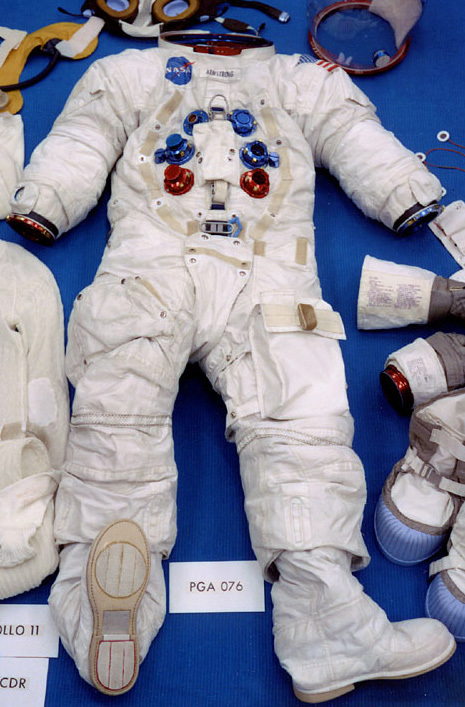 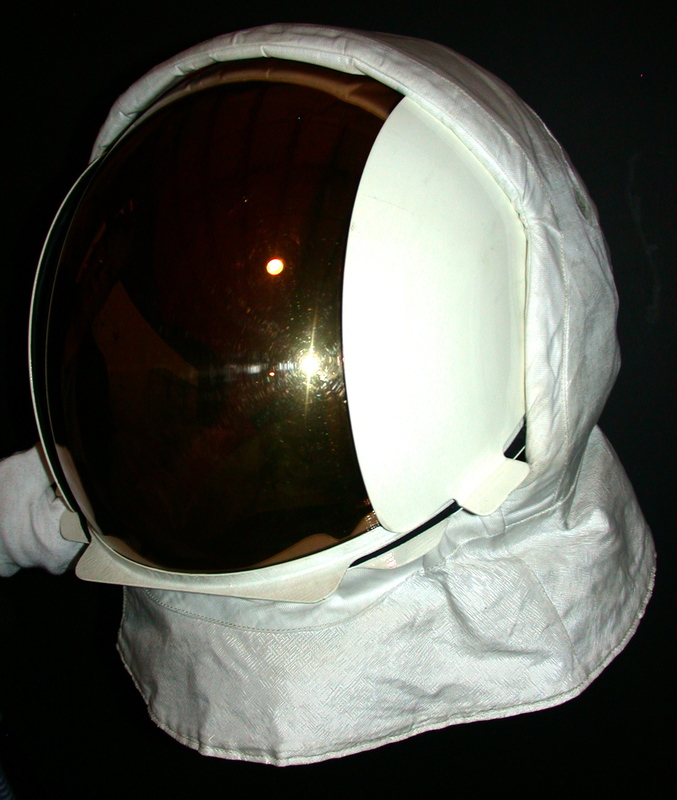 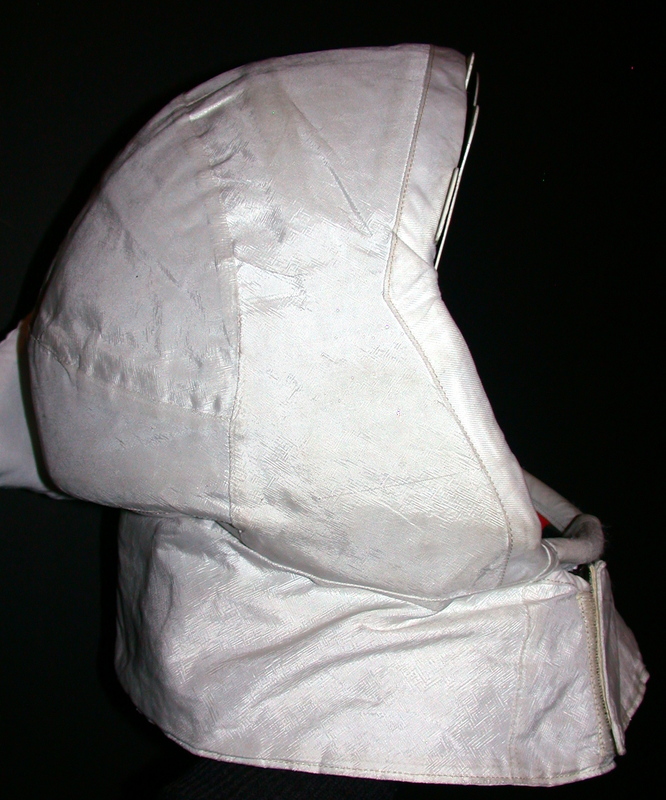 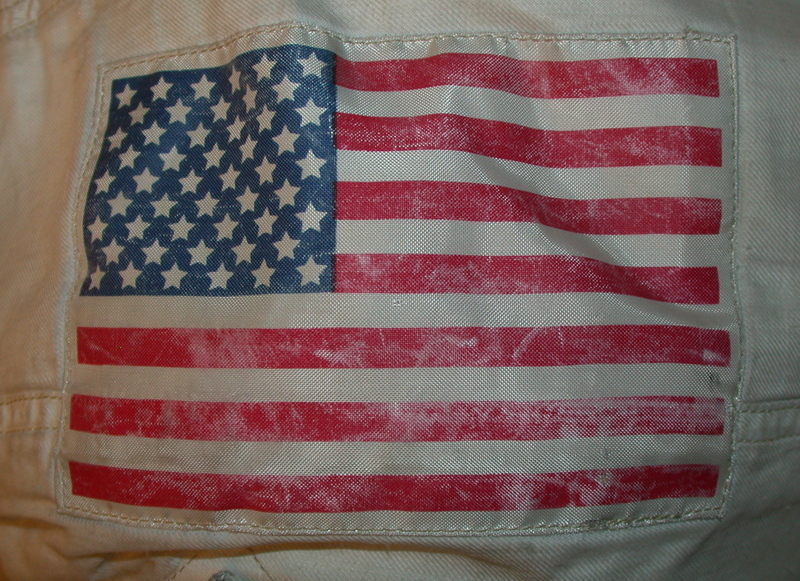 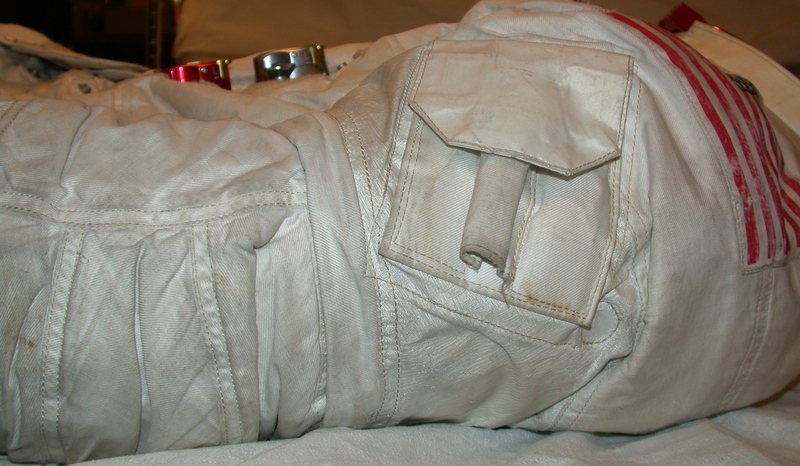 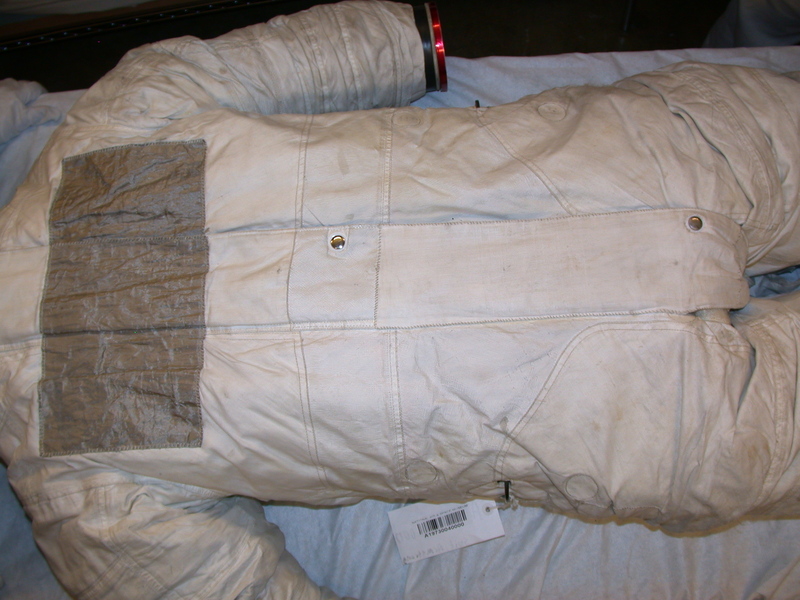 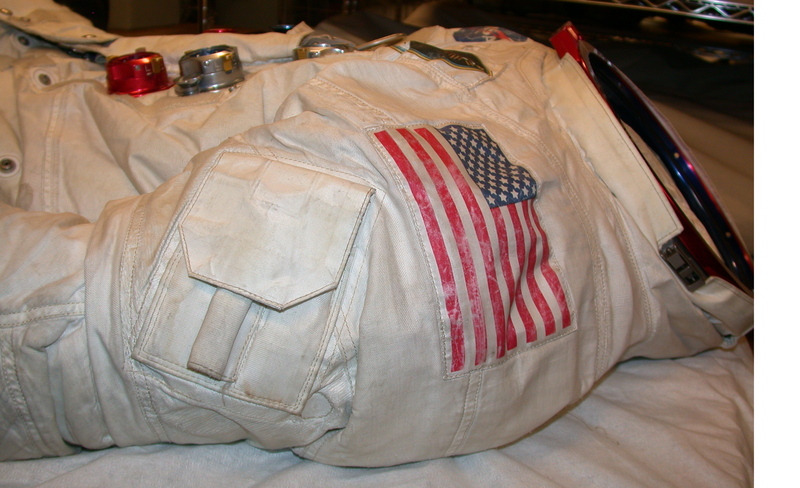 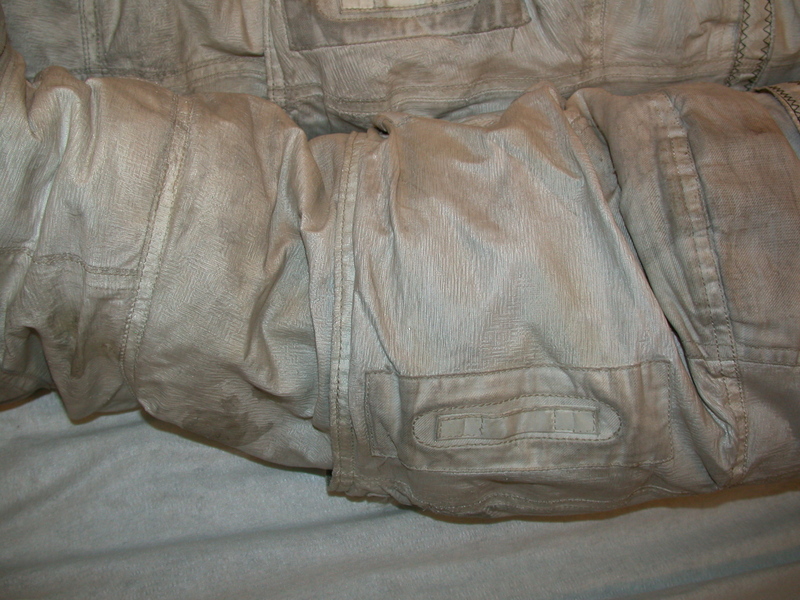 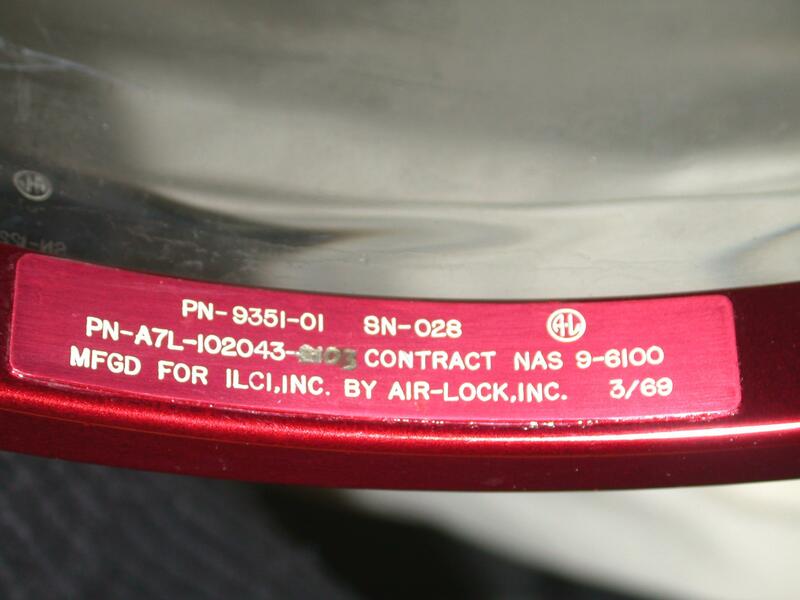 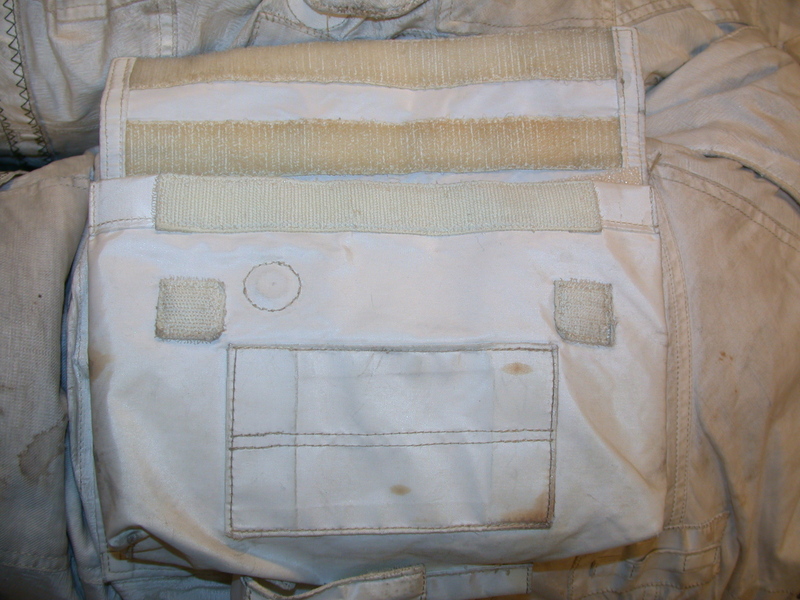 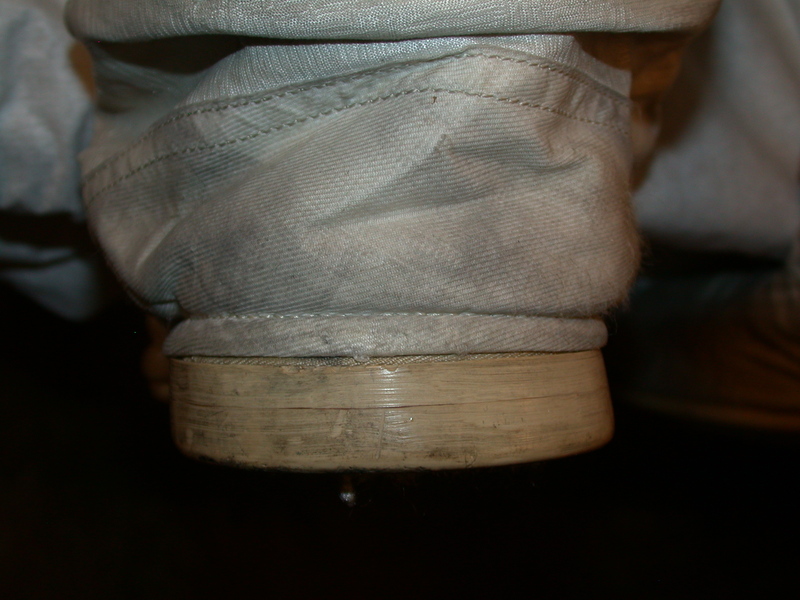 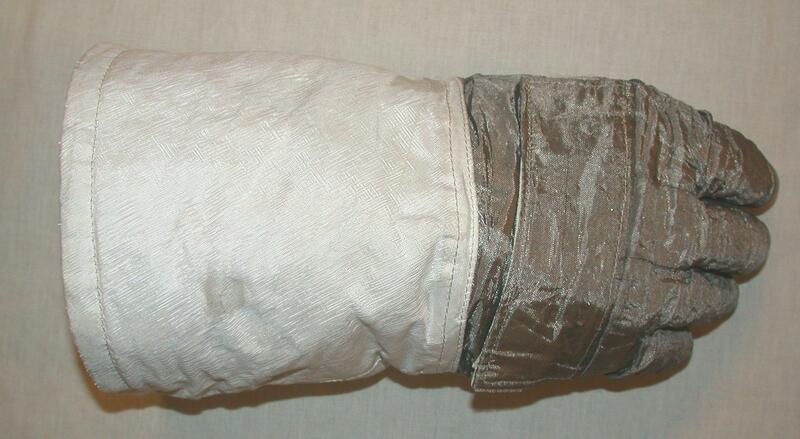 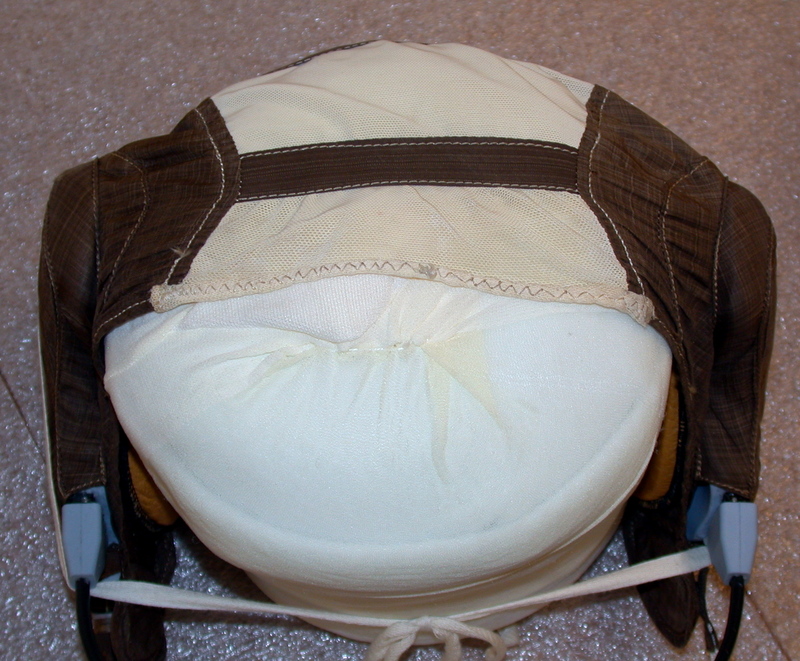 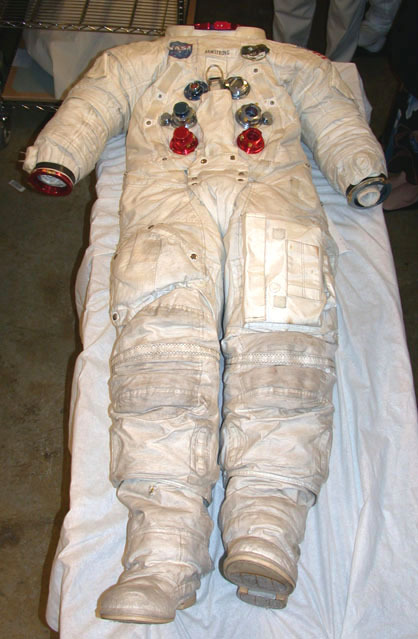 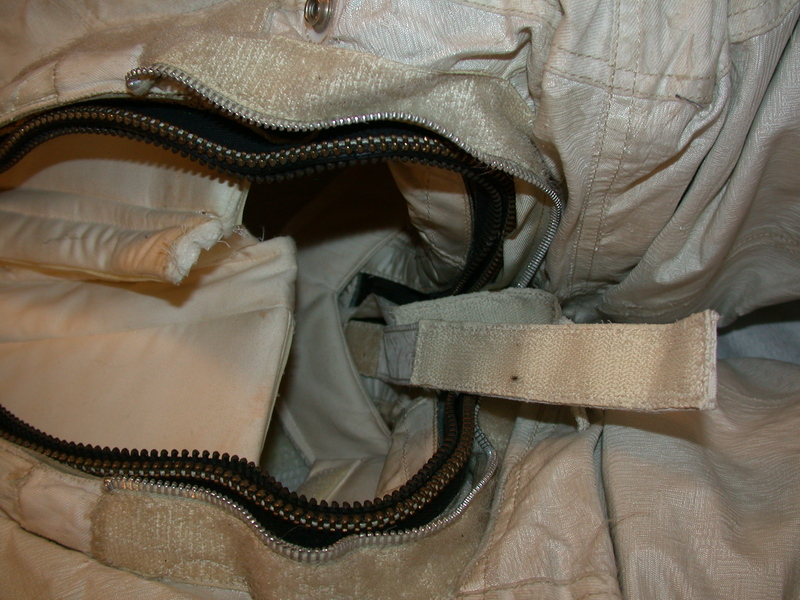 Detail from Pre-Flight photo (S69-38889) of Neil's Flown Suit. 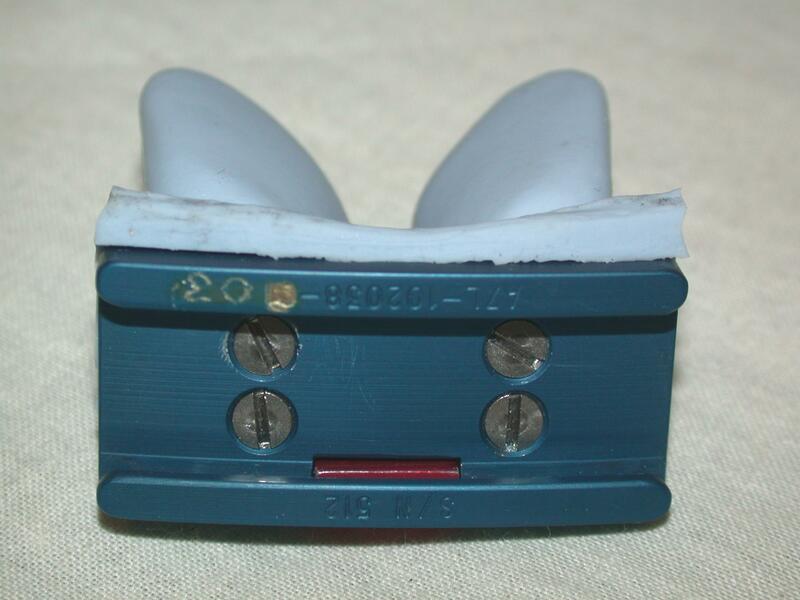 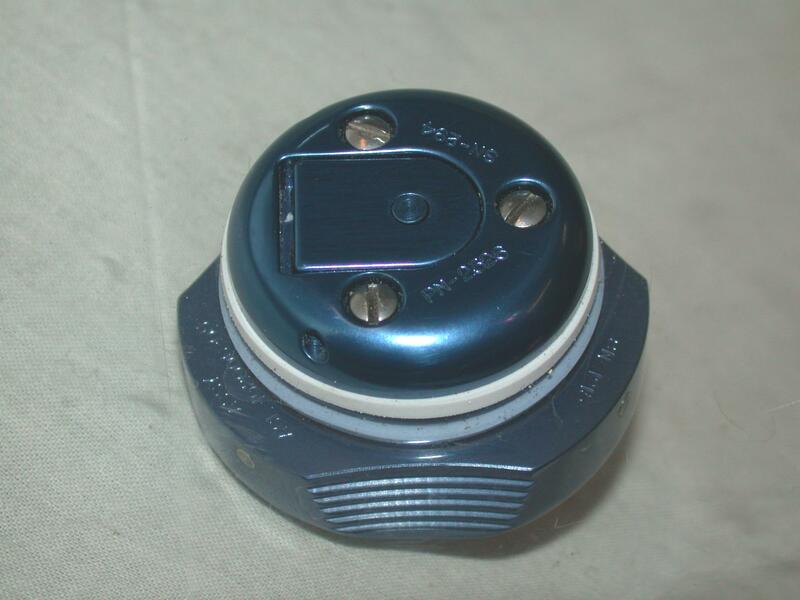 Diverter Valve Control and Righthand Connectors ( 1288k ) The connectors are identified in a diagram provided by Karl Dodenhoff. 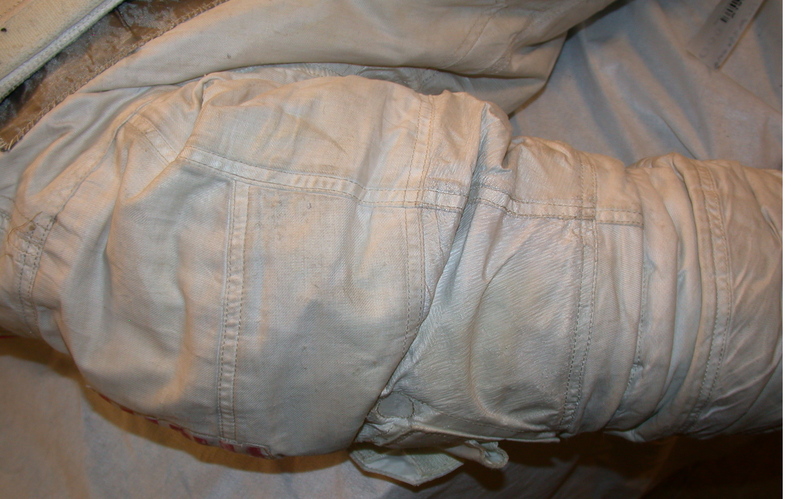 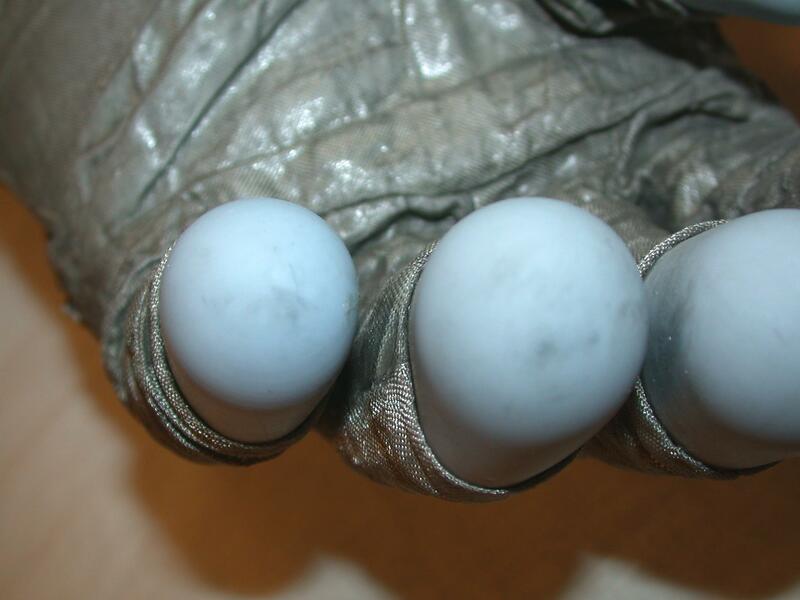 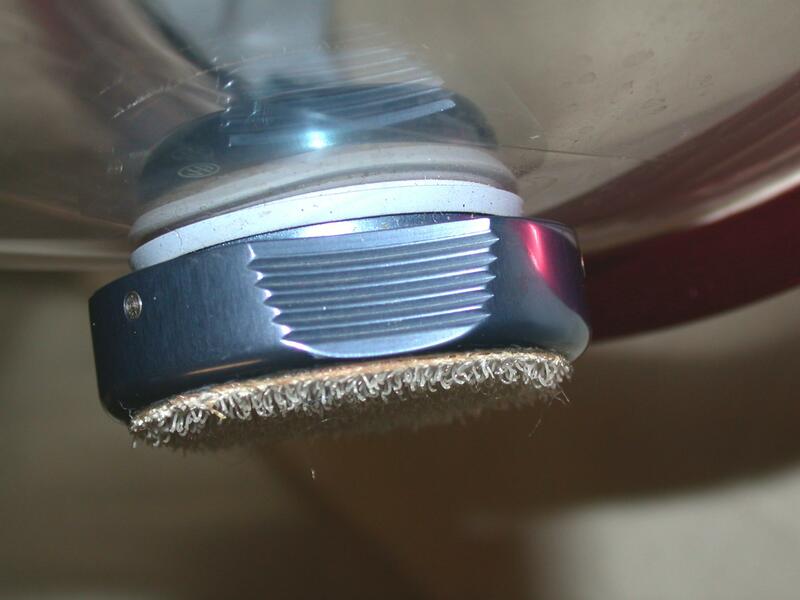 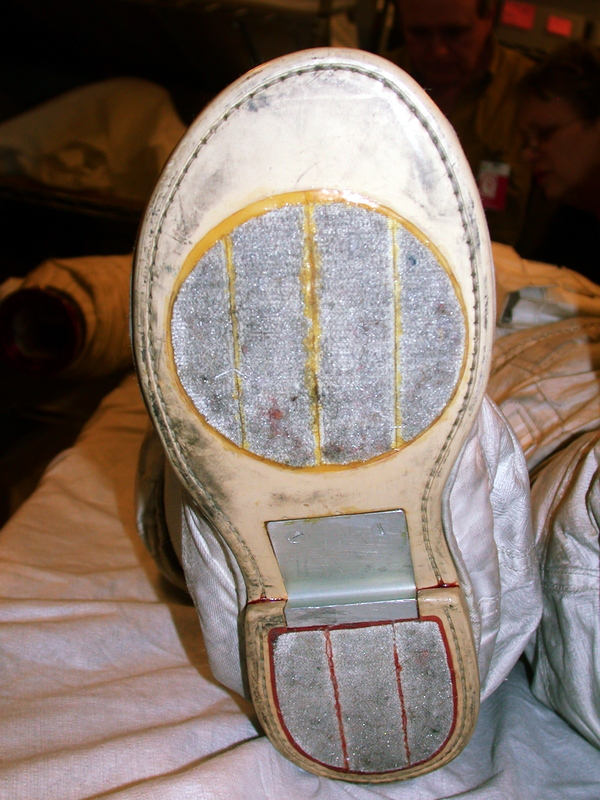 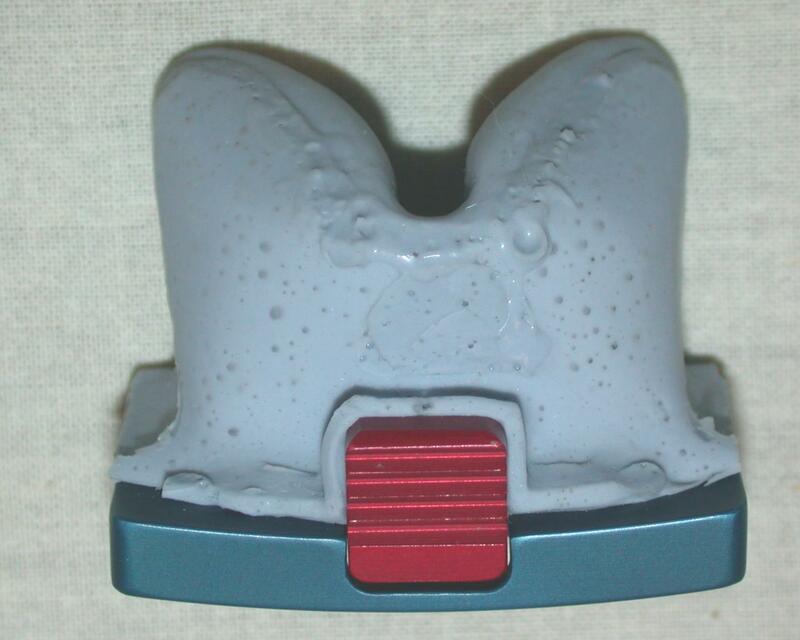 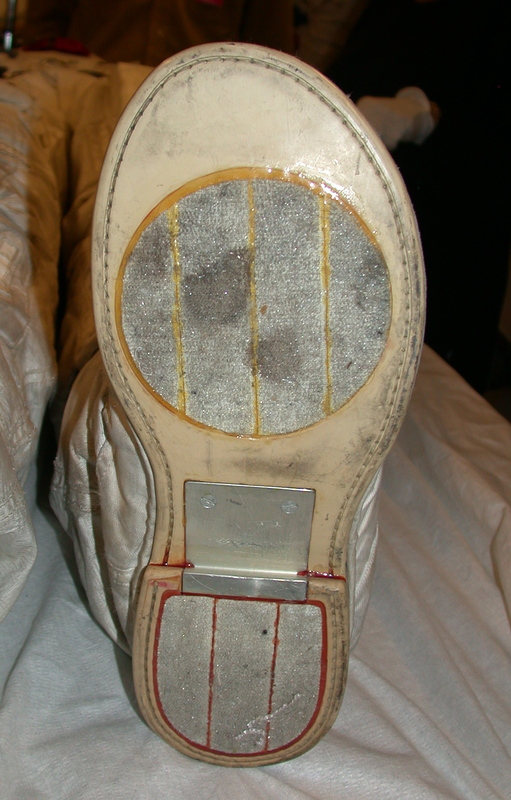 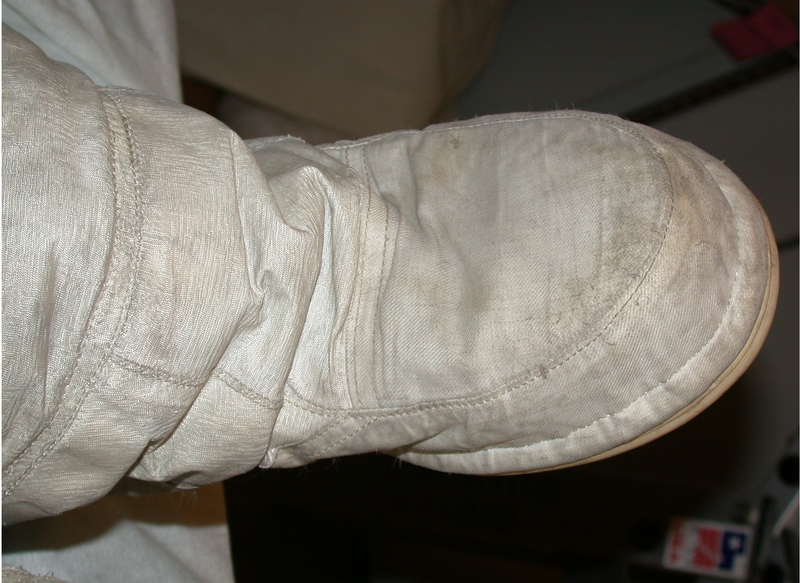 The upper parts of Neil's legs on the Moon. 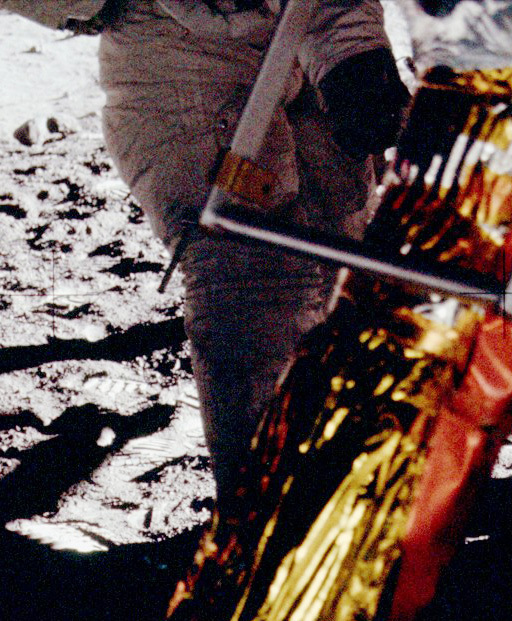 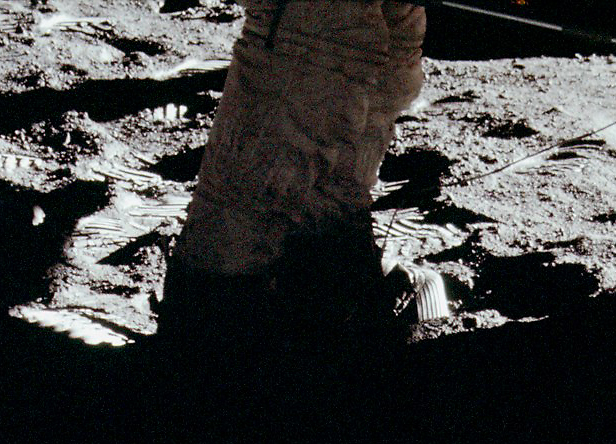 The lower parts of Neil's legs on the Moon (enhanced image). The left toe of Neil's EVA boot is sunlit. 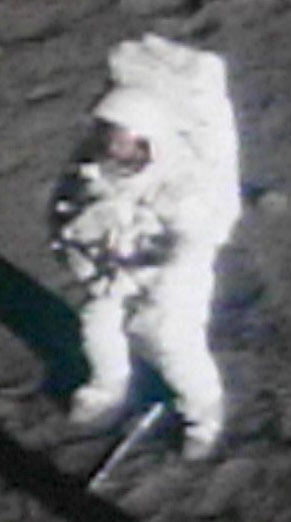 and, therefore, were not returned to Earth. Bill and Amanda turn the suit.